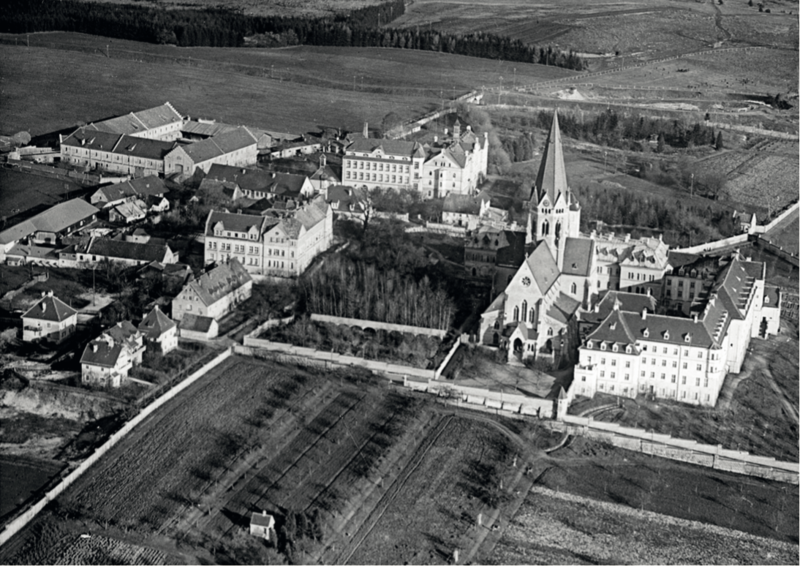 As the aerial photographs show, the monastery is surrounded by farm land and equipped with agricultural facilities. 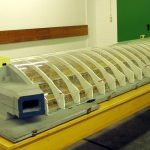 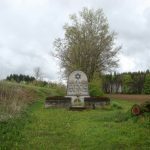 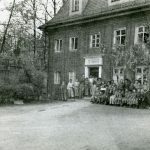 This was an asset for the installation of the military hospital in 1941 and later of the Jewish hospital as the huge farm could help to nourish the patients. 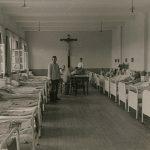 Another asset for the installation of the military hospital was the fact that the whole compound is surrounded by walls. 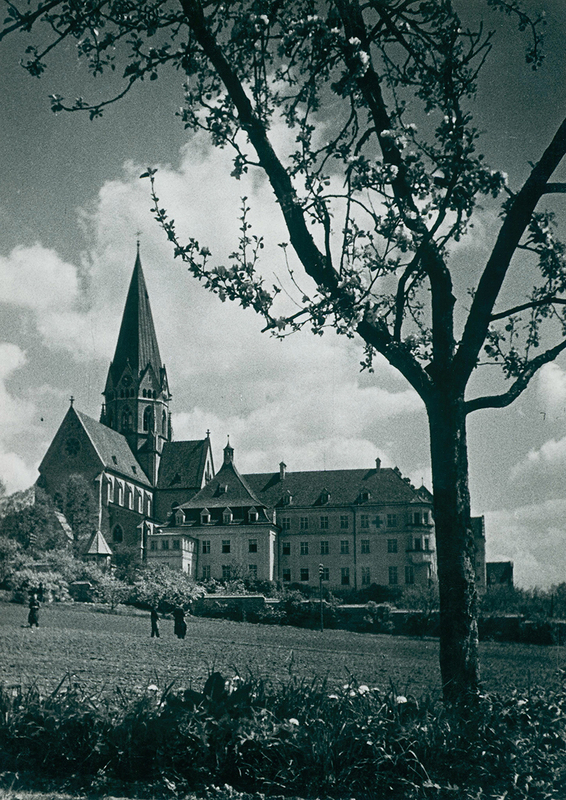 A photograph taken from a hidden spot shows how the monks are brought away in busses after the Gestapo had taken over the monastery compound on April 17, 1941. 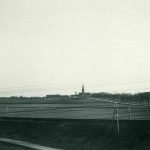 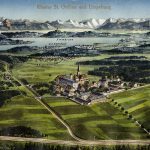 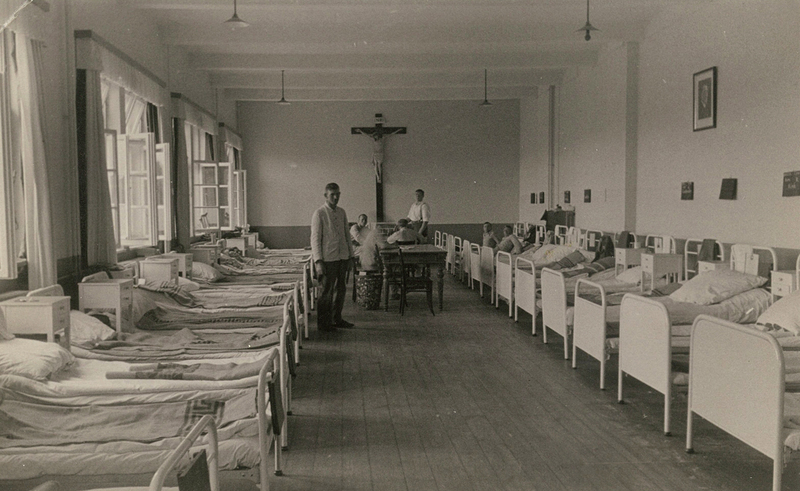 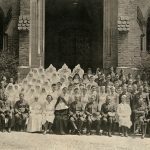 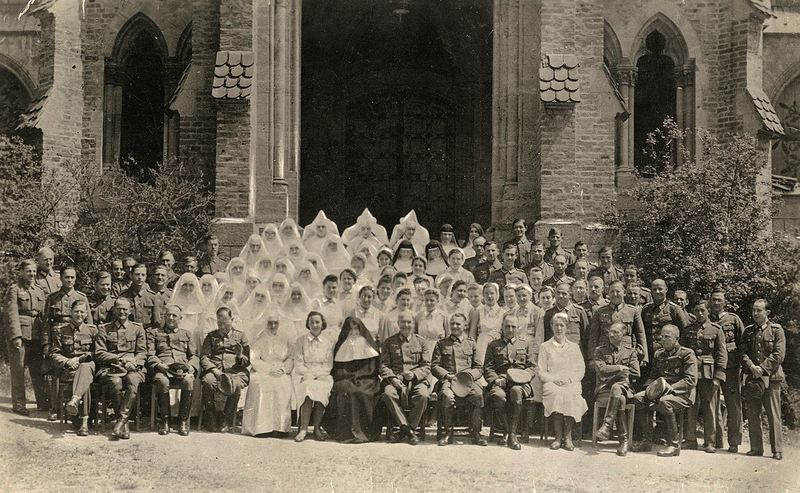 Around 60 monks were „obliged“ to continue their work on the farm and in the workshops which provided for the basic needs of the military hospital. 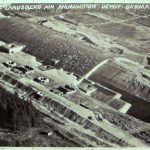 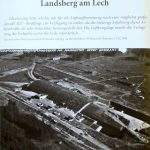 Under the code name „Ringeltaube“ a huge underground facility close to Landsberg am Lech was constructed starting from June 1944 where after completion military planes should be built. 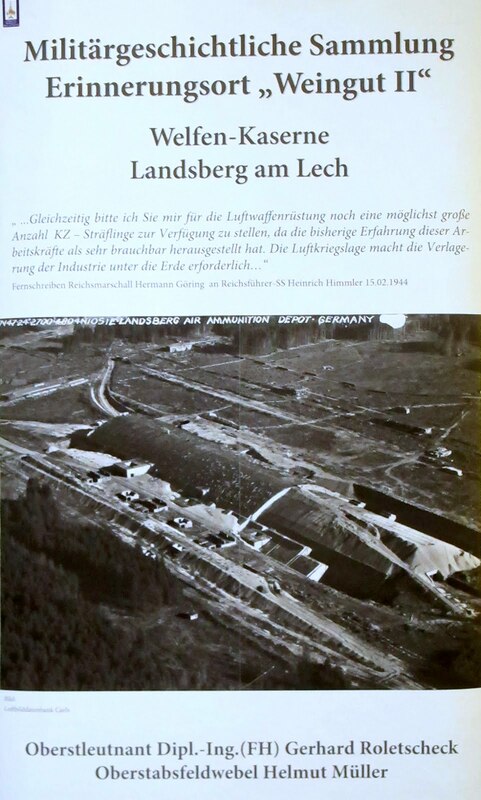 For the construction works about 23.000 prisoners, especially from Eastern Europe, were gradually brought to smaller concentration camps around Landsberg and Kaufering (Lager I-XI). 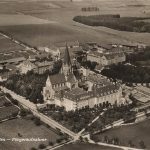 According to a recent counting, 6334 of these forced workers (male and female) died during the construction which continued until the last days of the war. 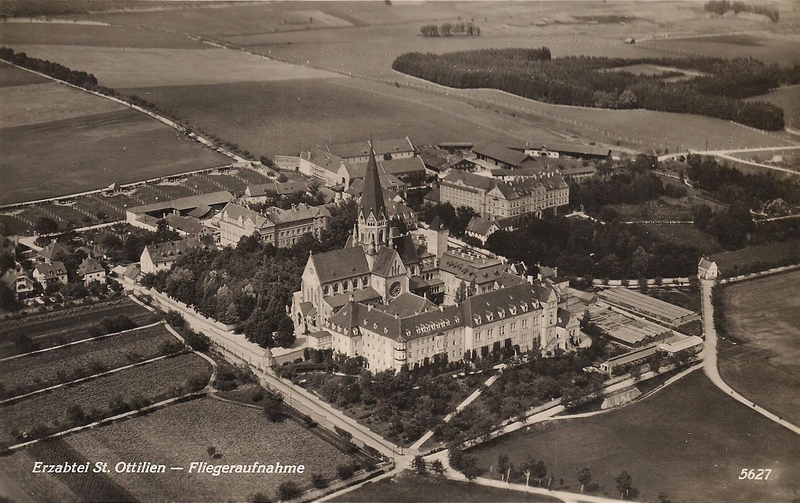 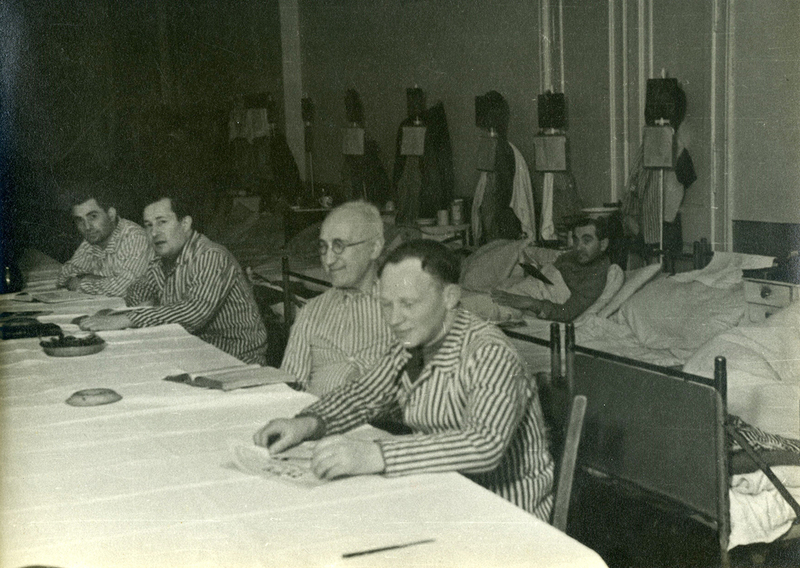 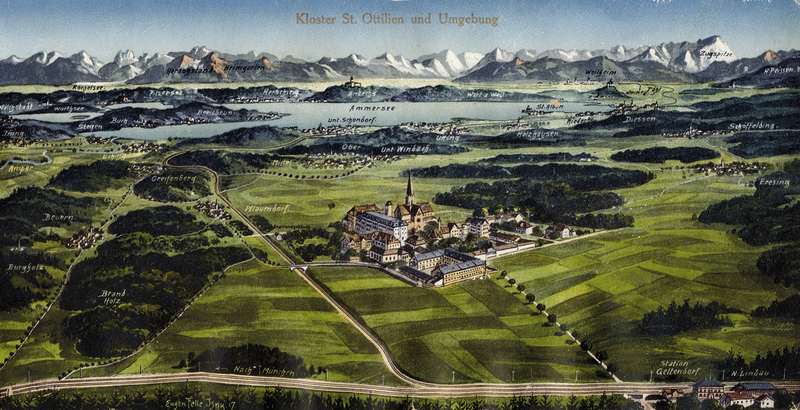 The first patients of the St. Ottilien Hospital came from these concentration camps. 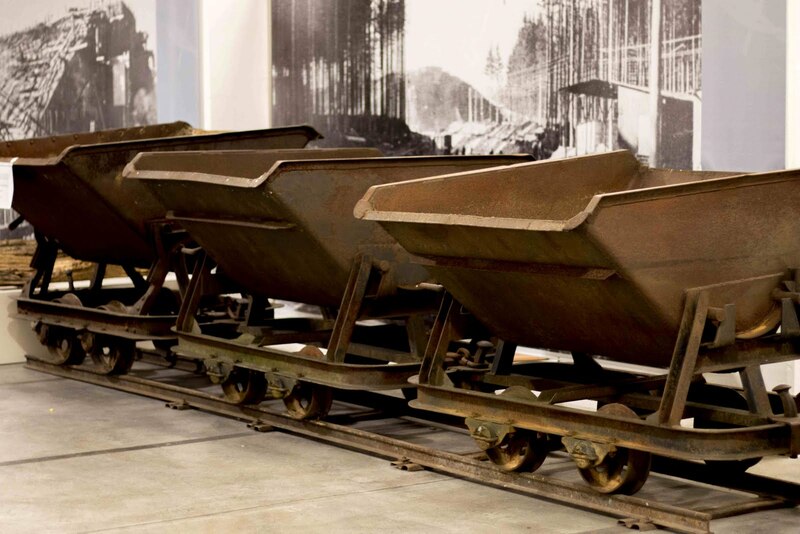 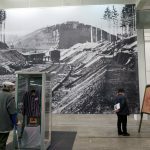 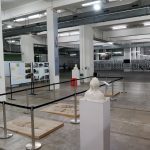 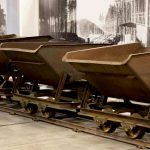 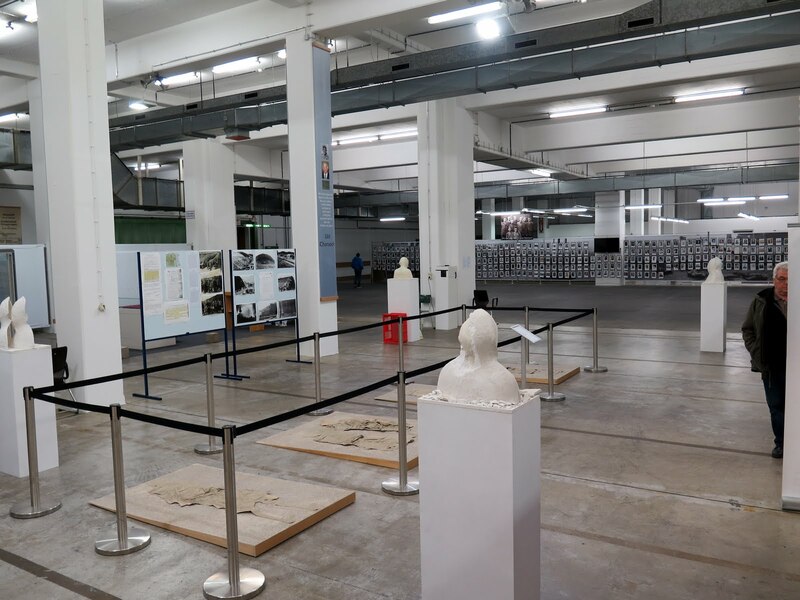 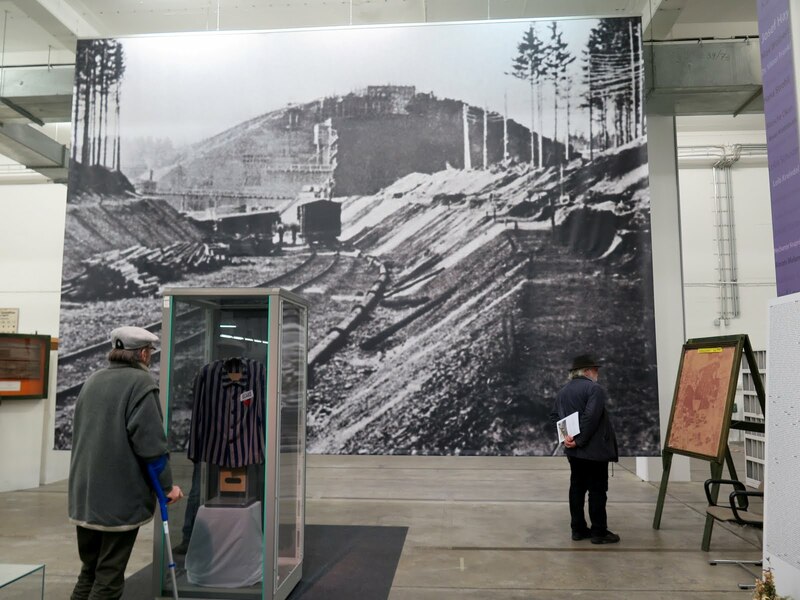 Today the underground facility is part of a Military Compound of the German Army („Welfenkaserne“) which honors the victims in a permanent exhibition. 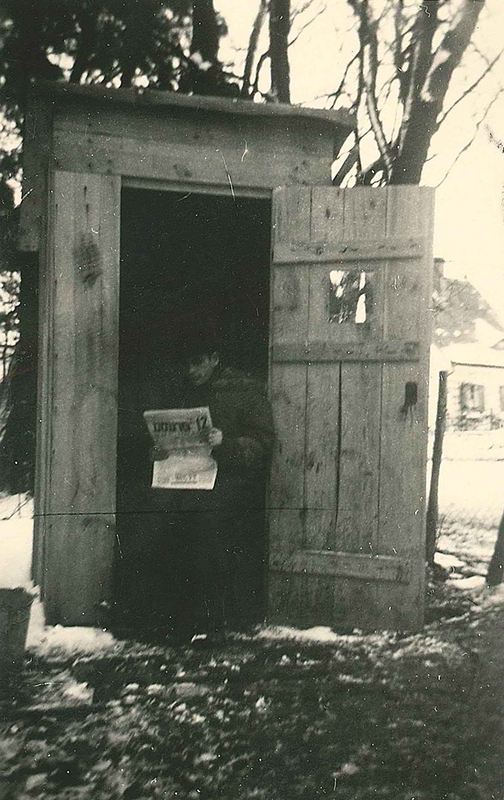 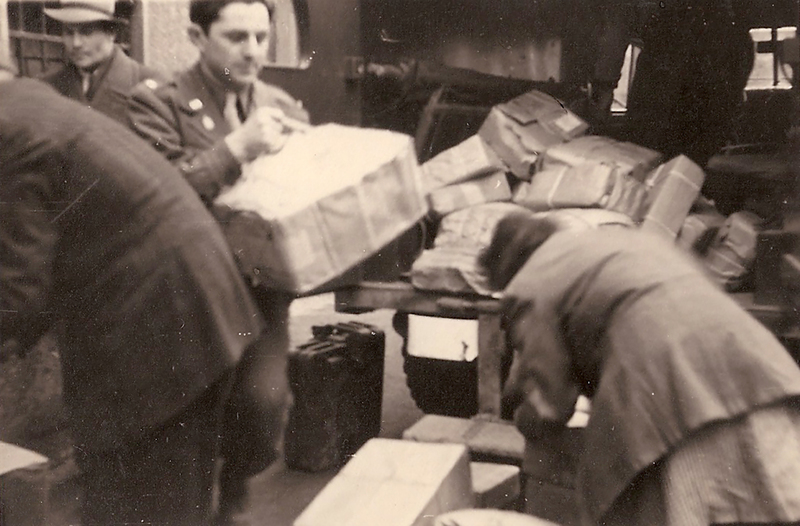 Here is a photo of the bunker during construction process shortly before the end of the war. 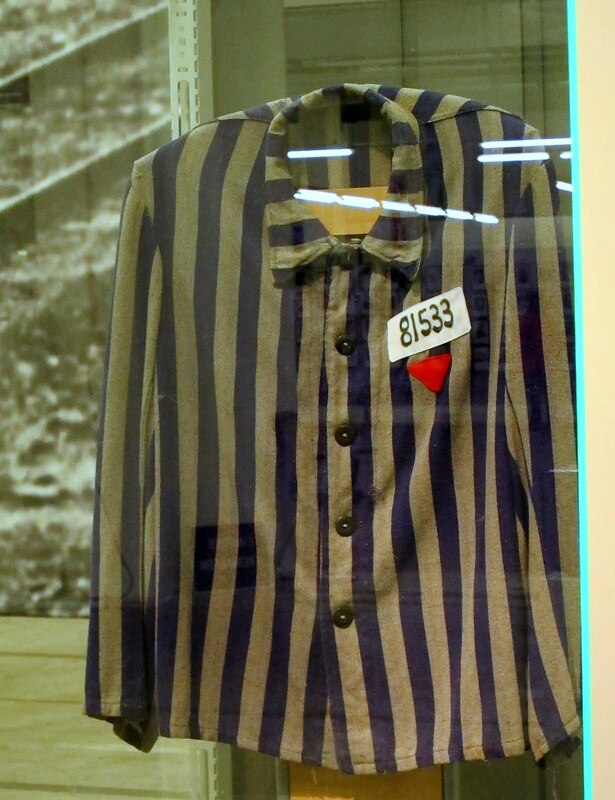 Jacket worn in the camp by Uri Chanoch and donated to the museum before his recent death. 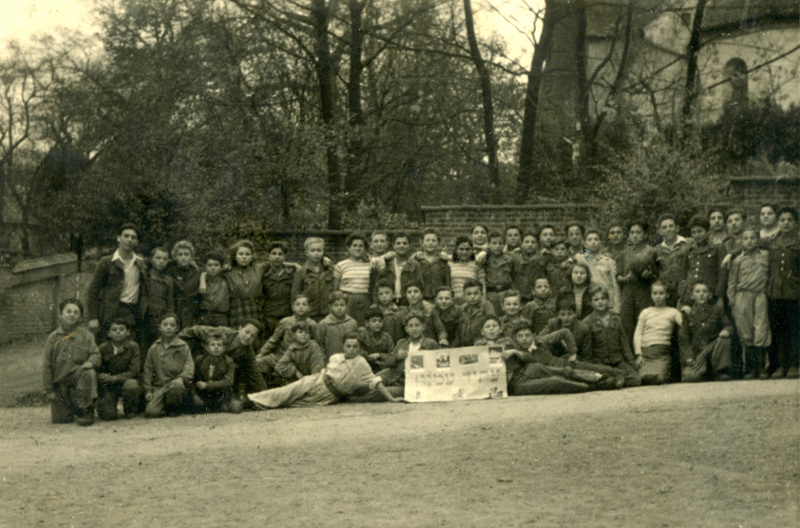 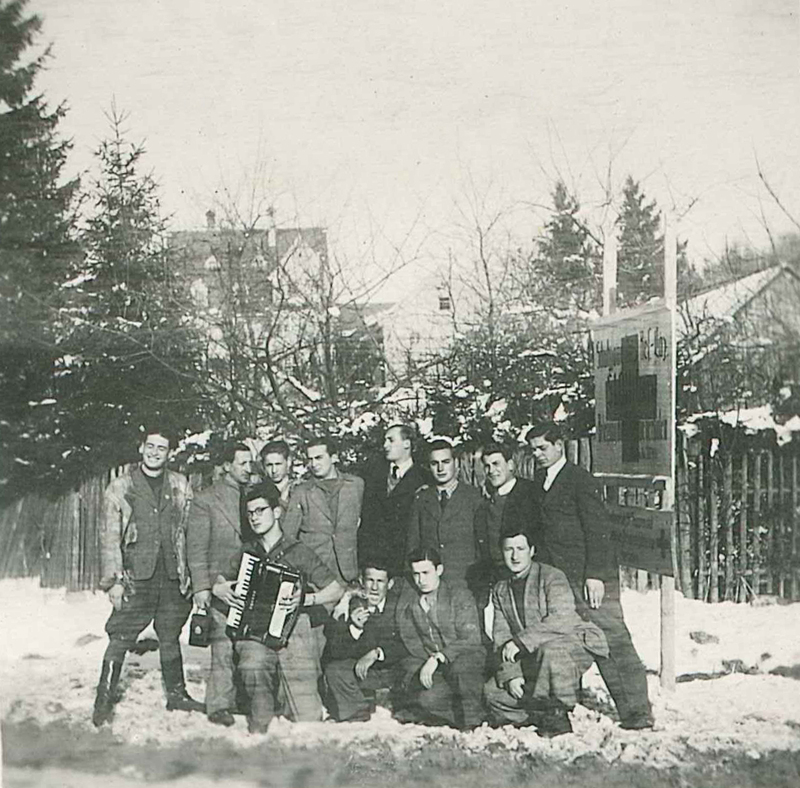 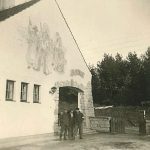 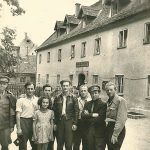 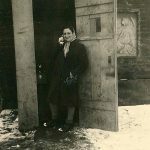 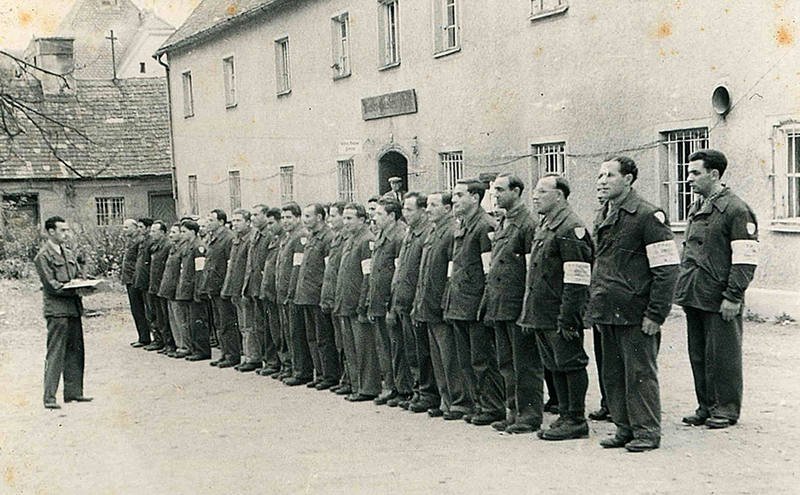 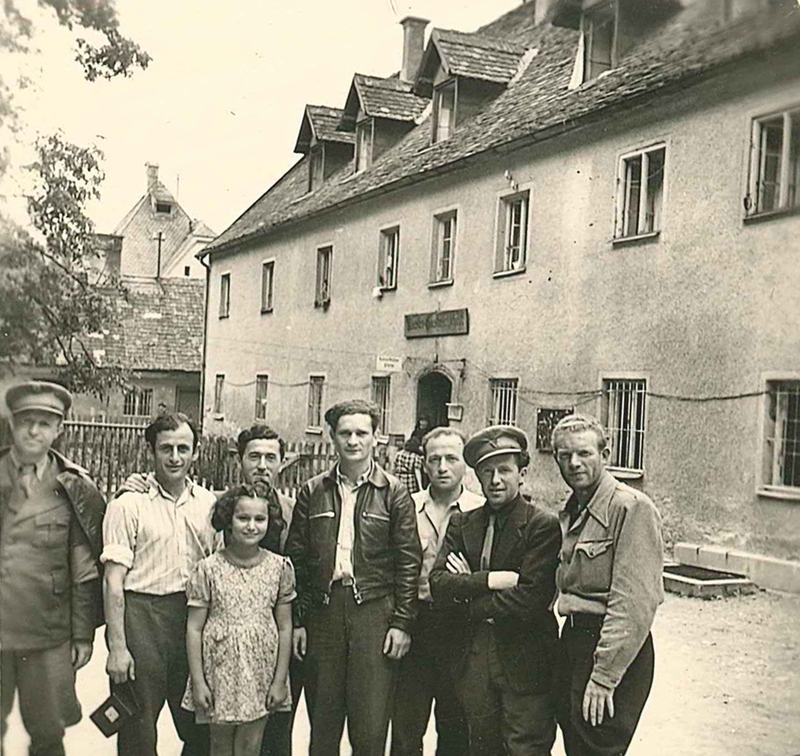 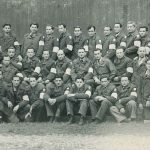 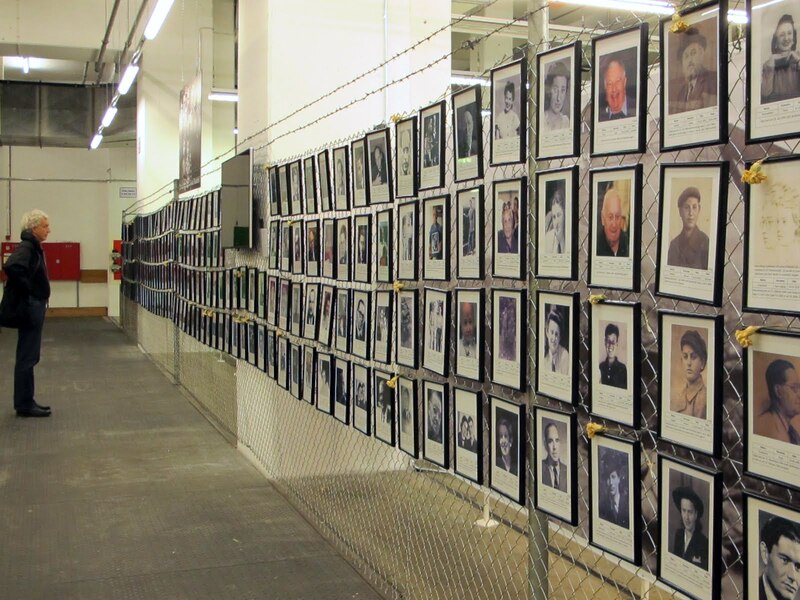 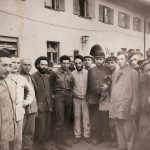 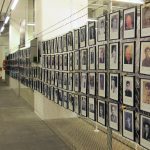 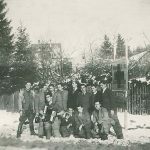 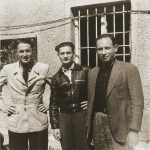 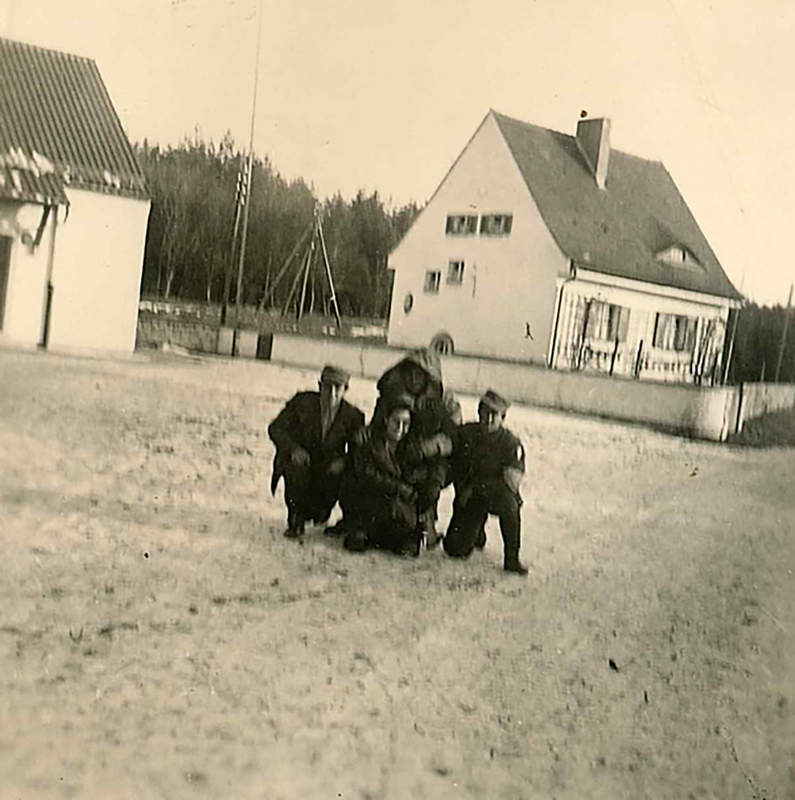 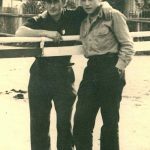 Photos of about 350 former prisoners in Kaufering and Landsberg. 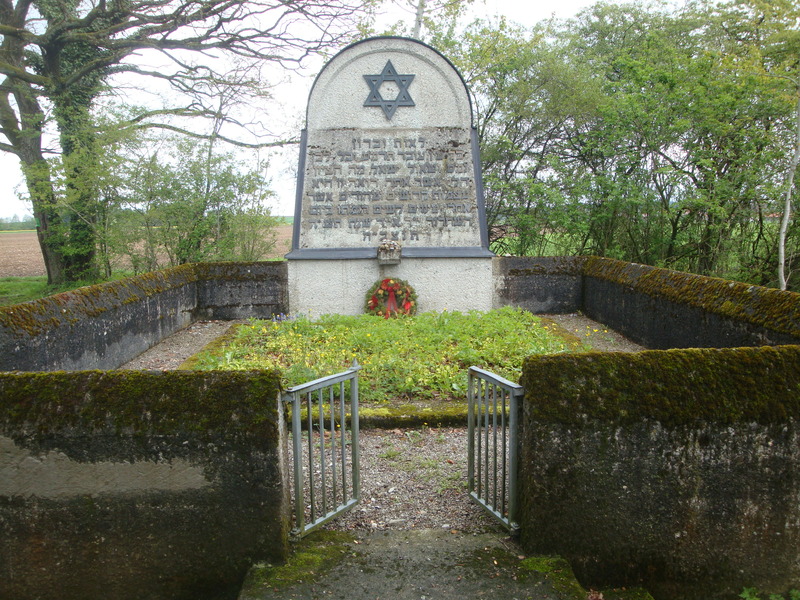 The frames adorned with a yellow carnation indicate a person who did not survive the camp. 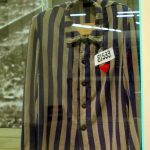 The prisoner who wore this jacket, Uri Chanoch, gave it to the Place of Memory a few years ago. 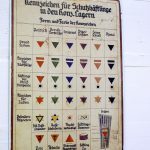 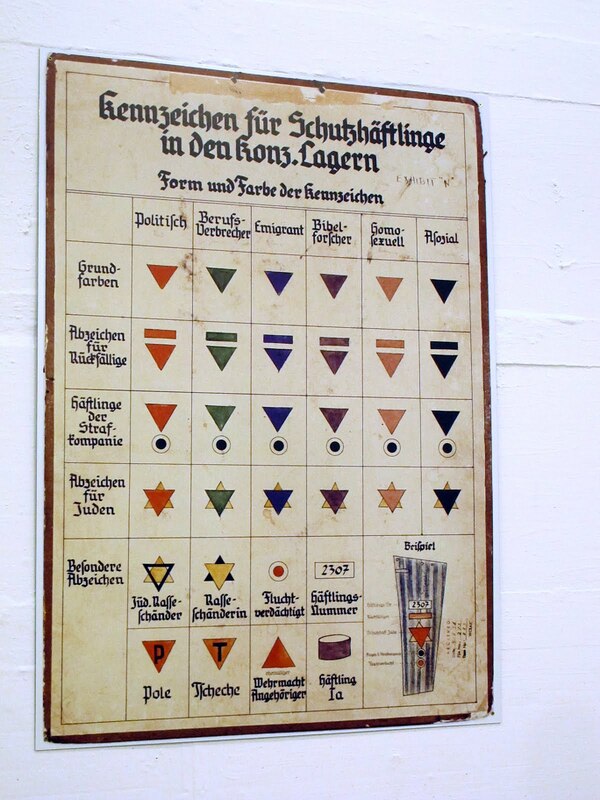 These were the symbols used for the different type of prisoners in the concentration camps. 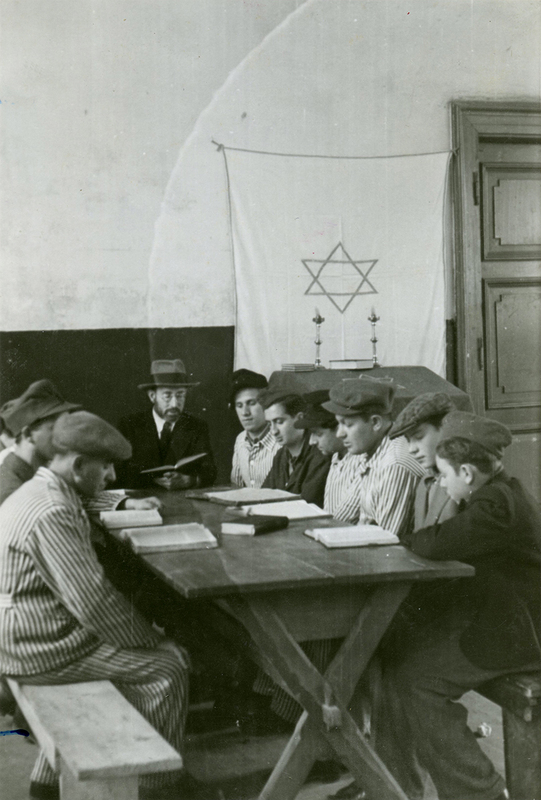 Poltical, emigrants, „Bible researchers“, homosexuals, asocial, Jews, Poles, and so on. 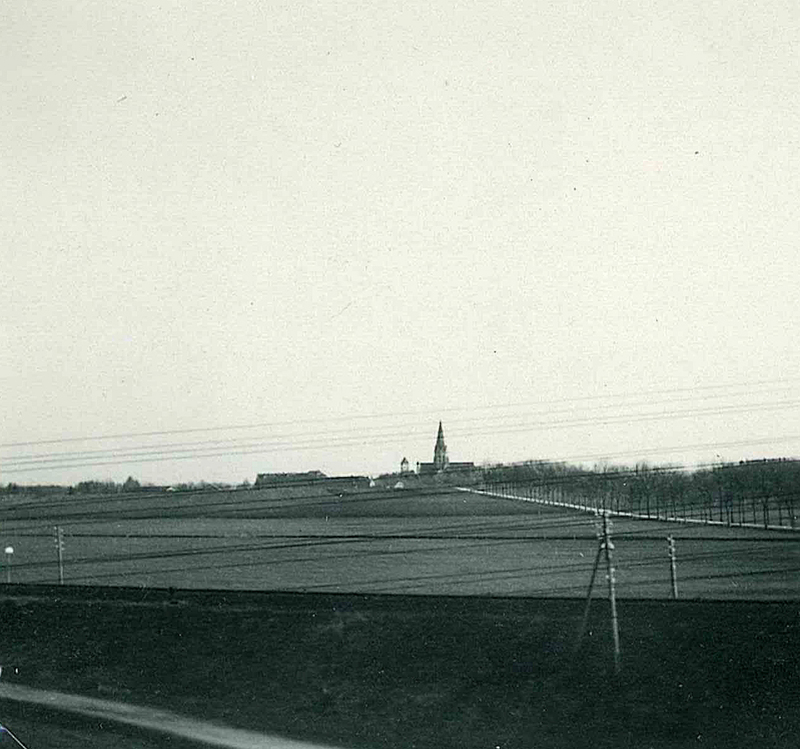 The original bunker wall is on the right. 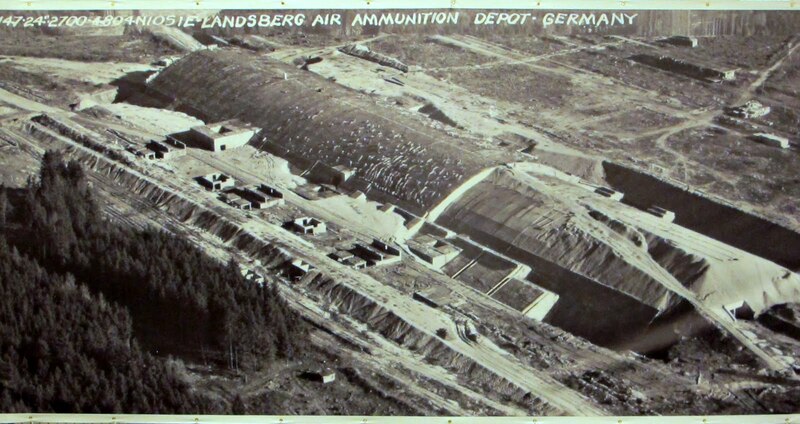 The one on the left was built after the war when the bunker found other uses than the originally intended one. 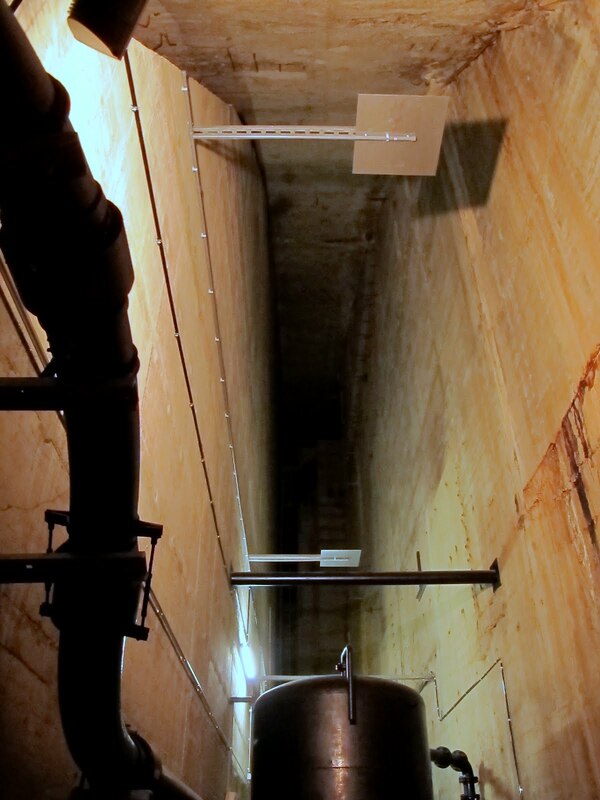 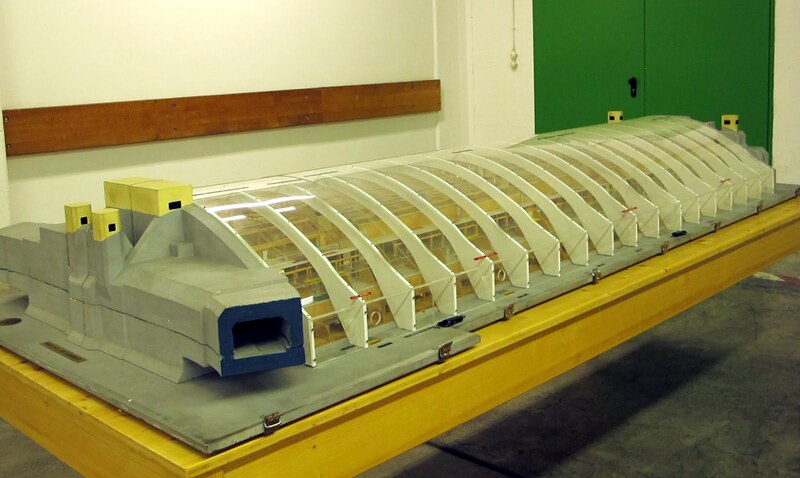 The bunker is autark, providing its own electricity so the computers used for repair of jets keep an even stream of energy flow for a week of tests. 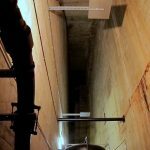 There is a well under the bunker for water needs. 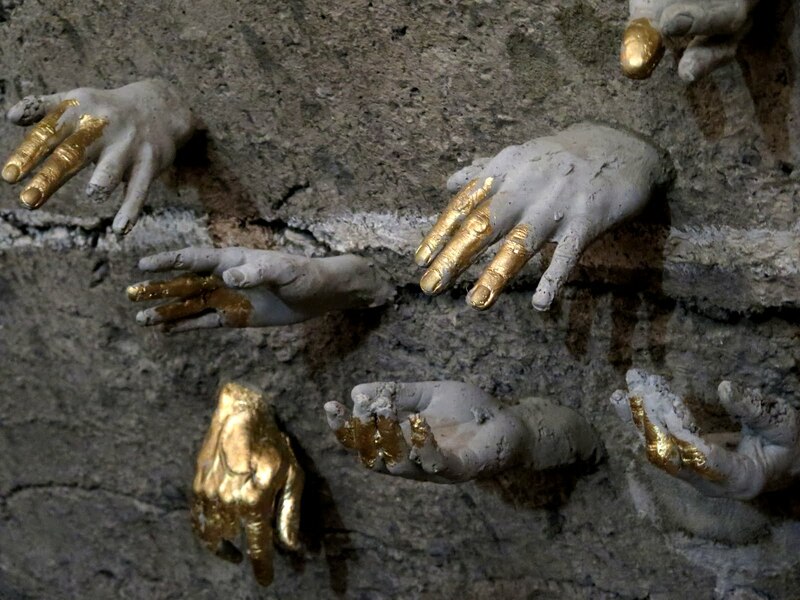 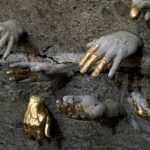 „Touch me!“ Symbolic hands of victims who were buried in the cement of the walls. 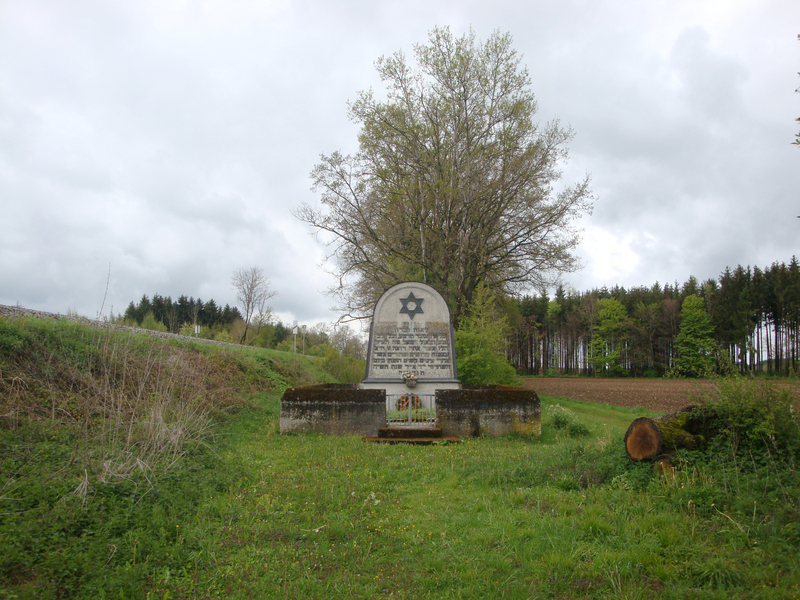 The three mass graves for about 130-140 victims lie close to the railway line from Kaufering to Munich, about 2 kilometers from the village of Schwabhausen. 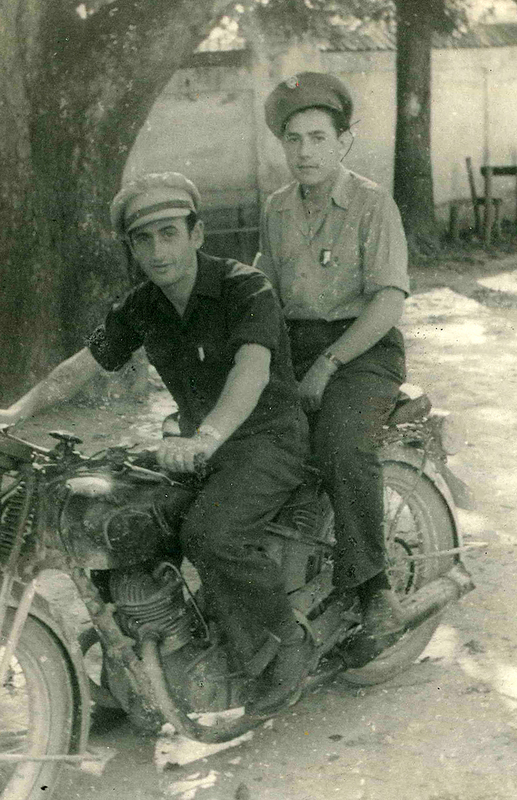 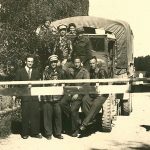 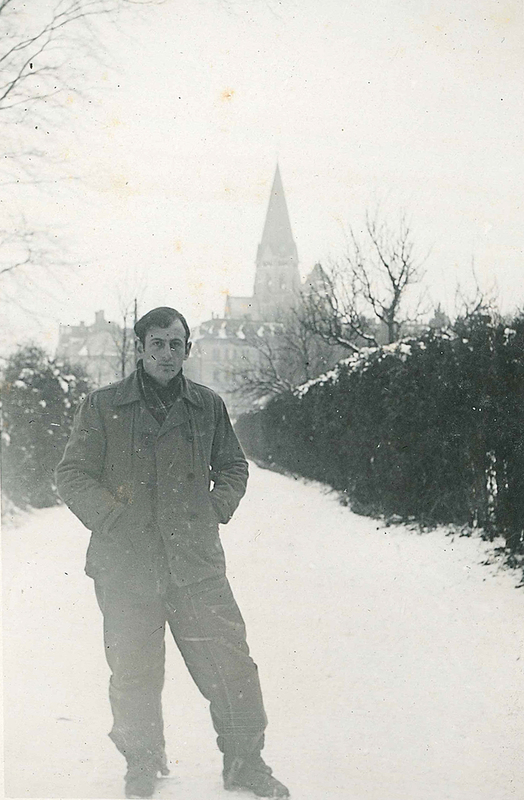 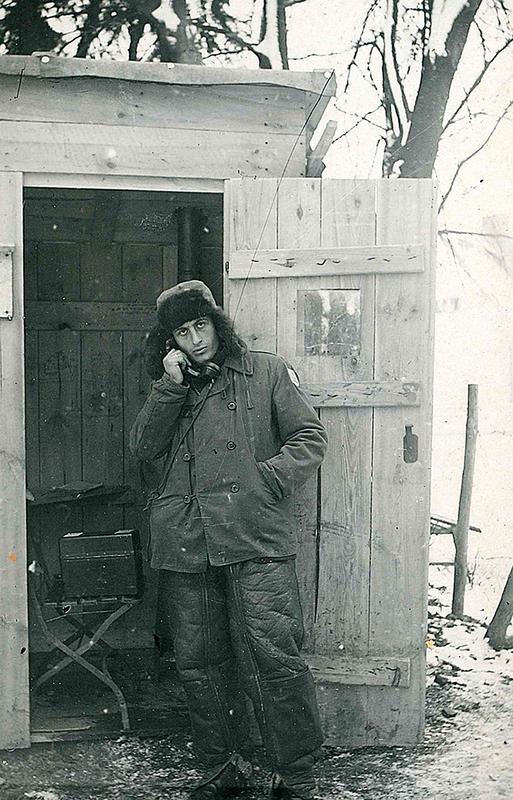 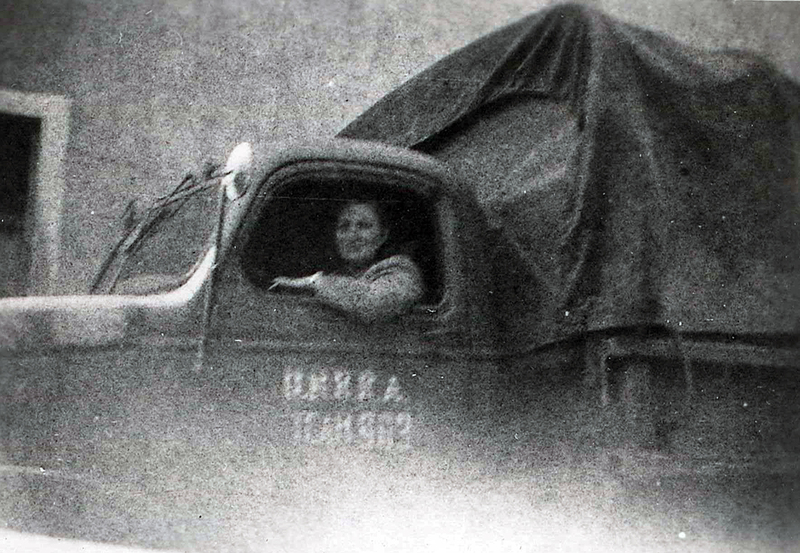 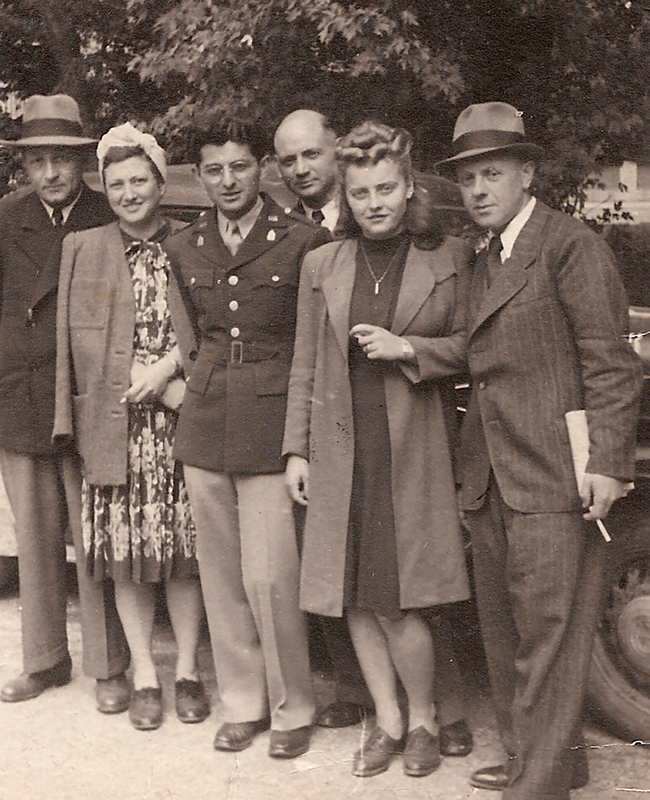 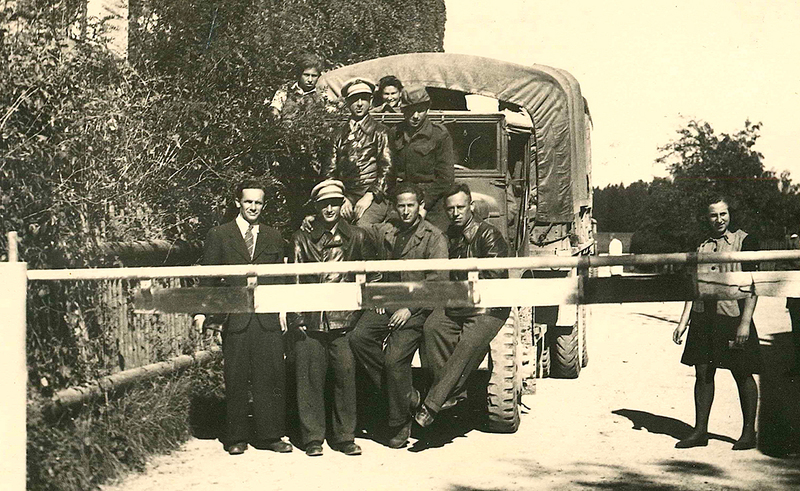 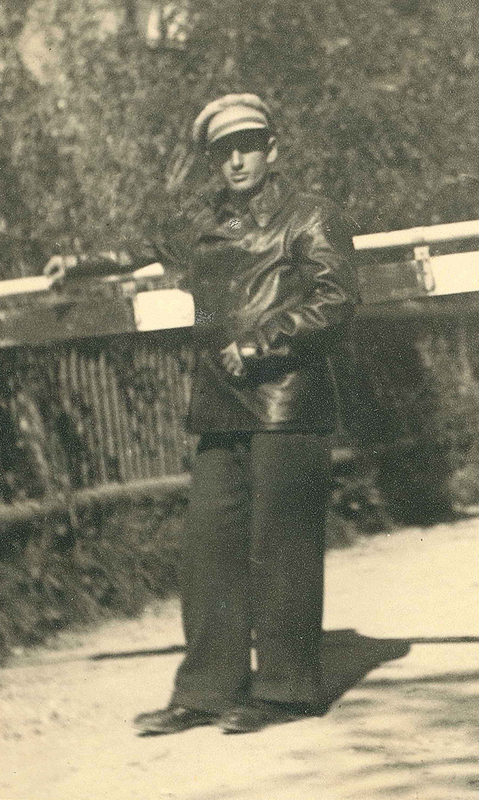 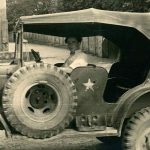 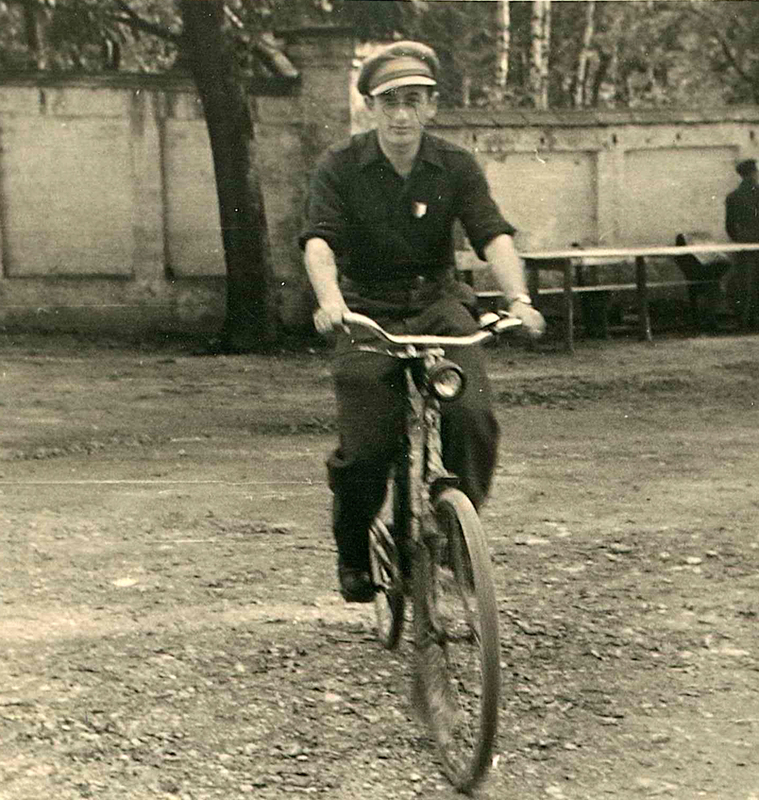 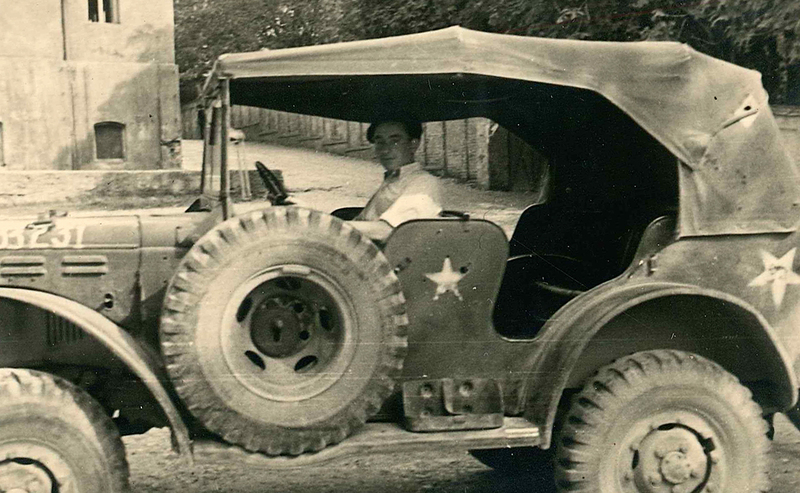 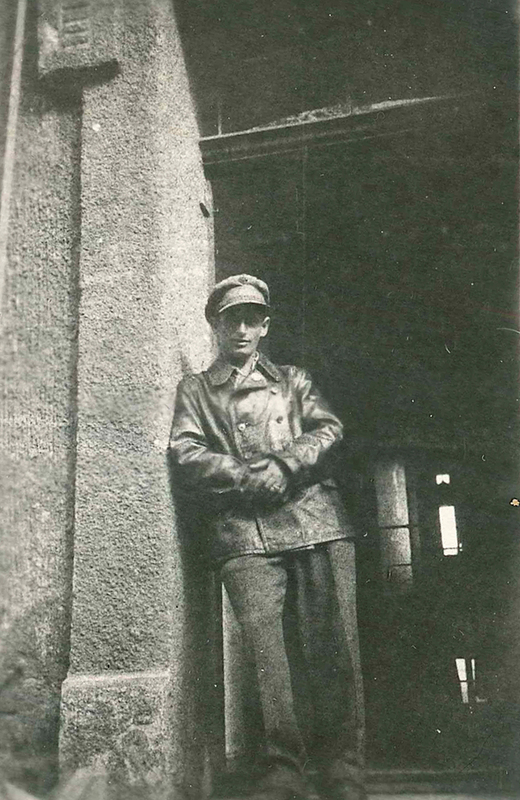 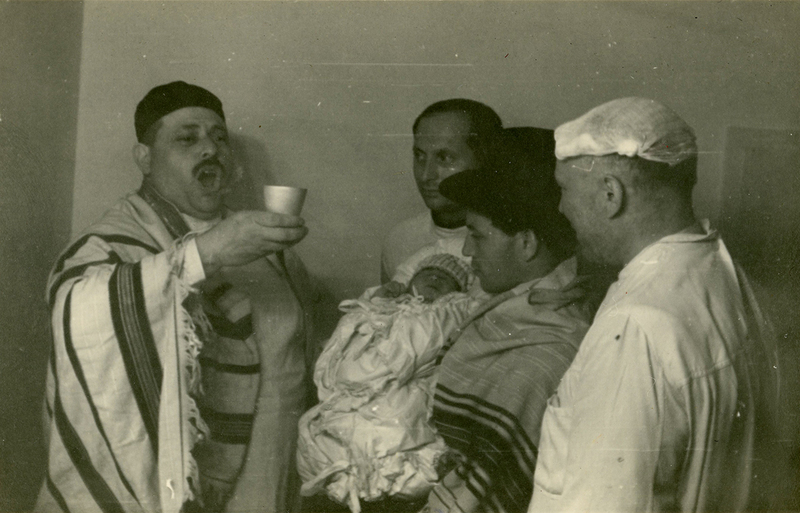 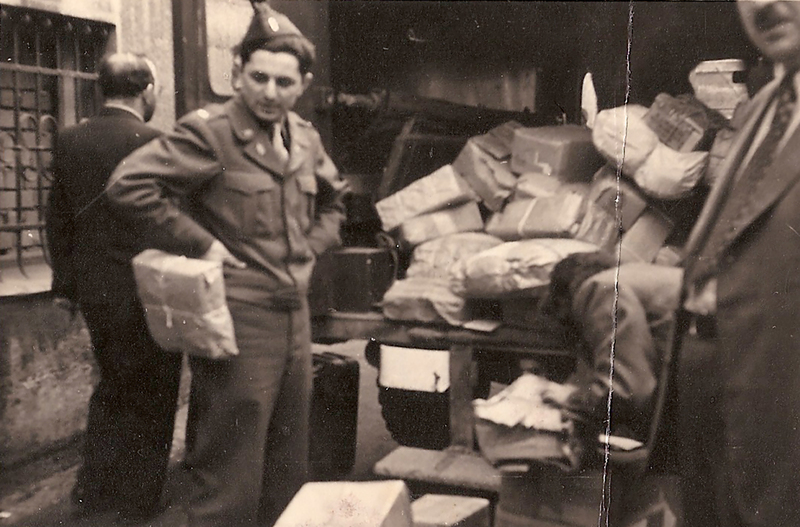 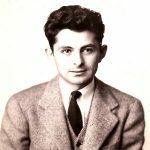 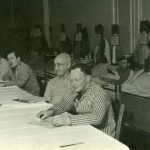 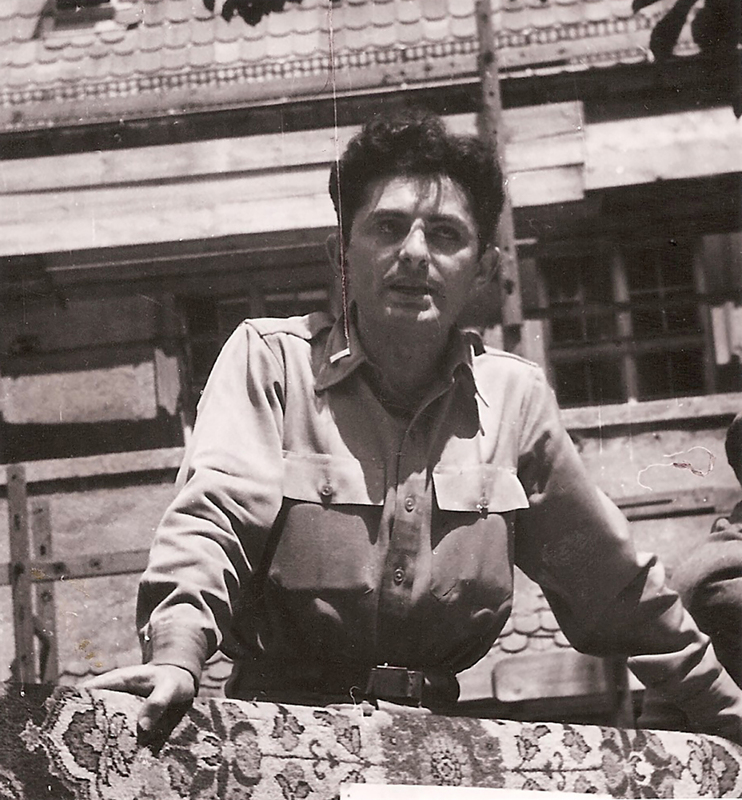 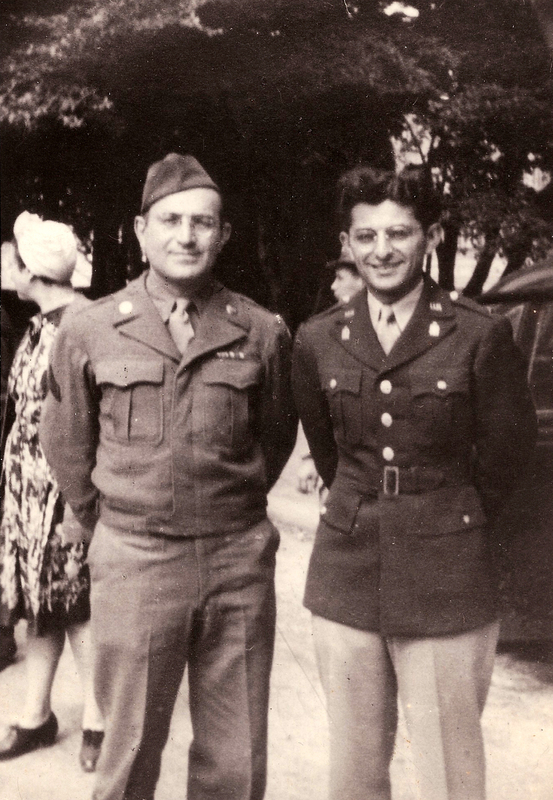 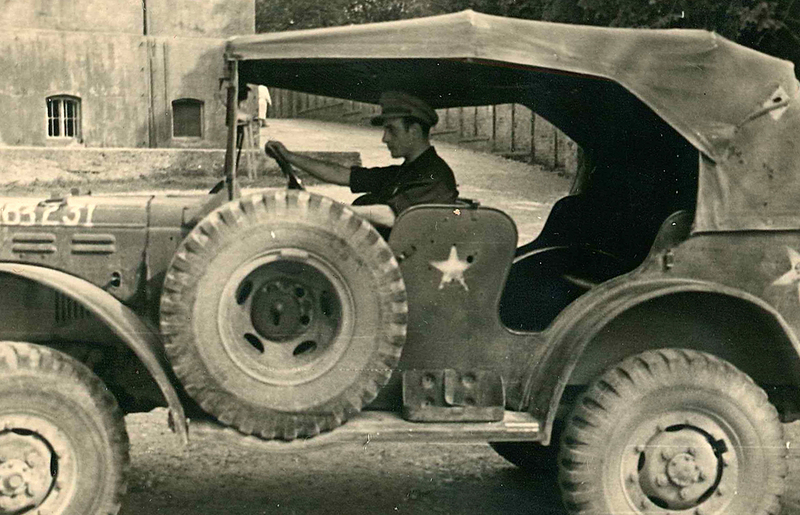 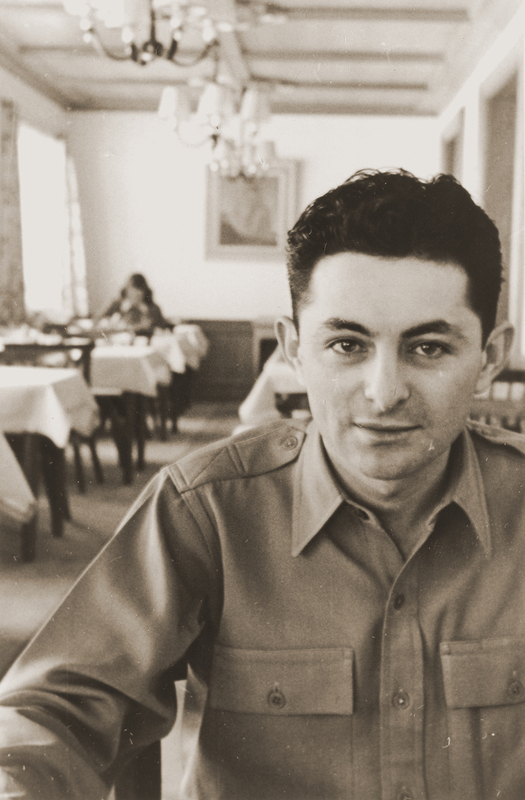 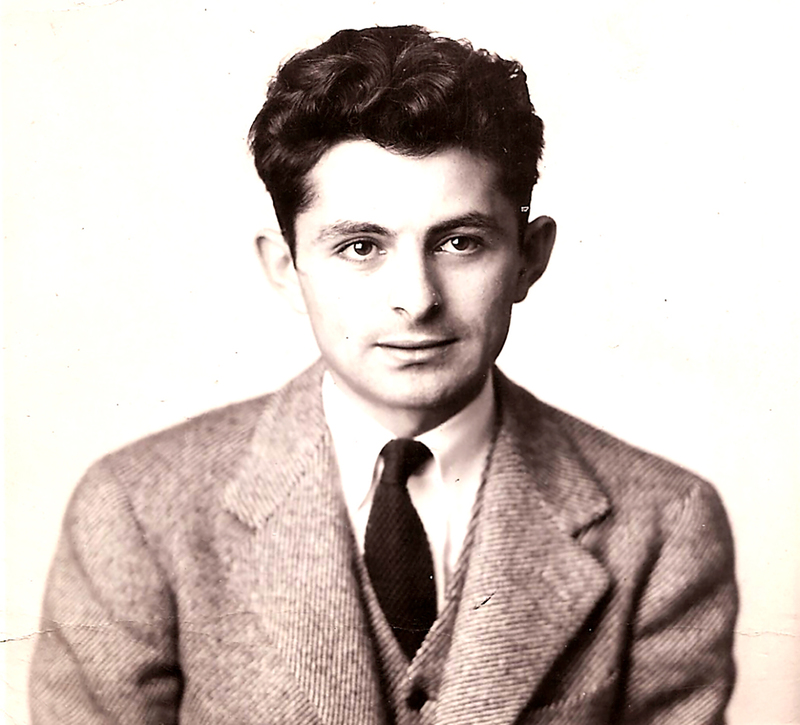 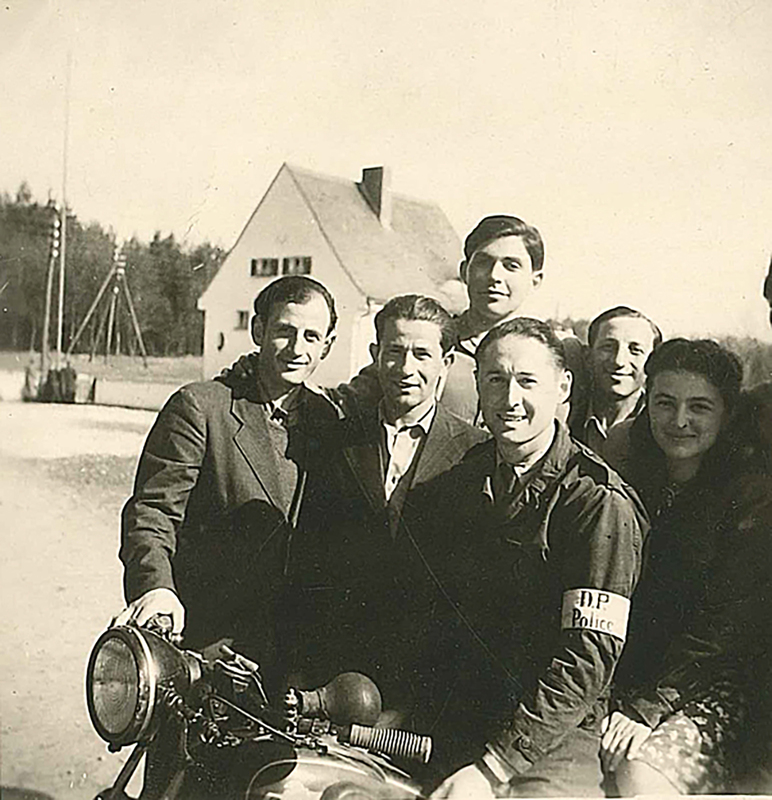 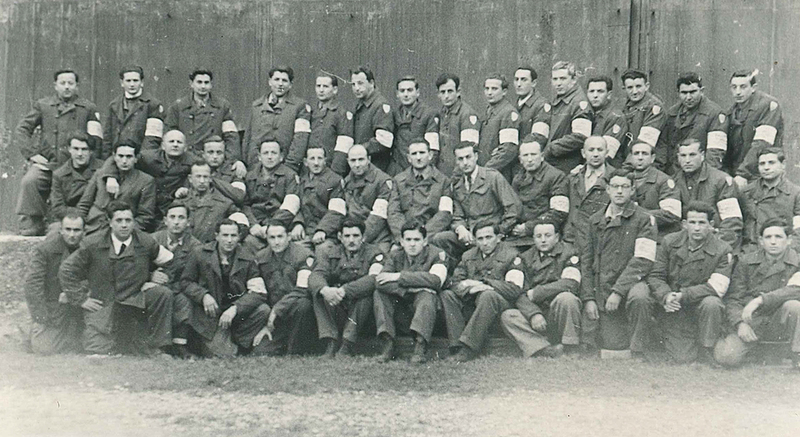 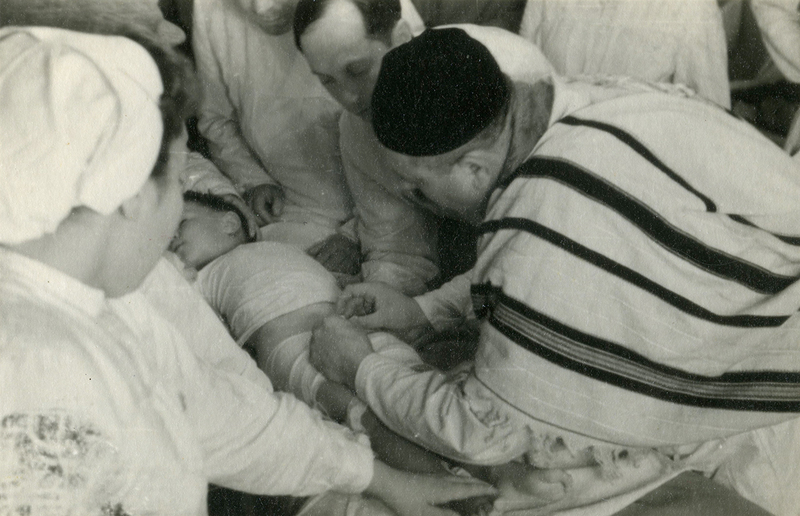 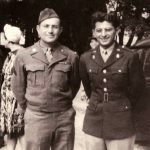 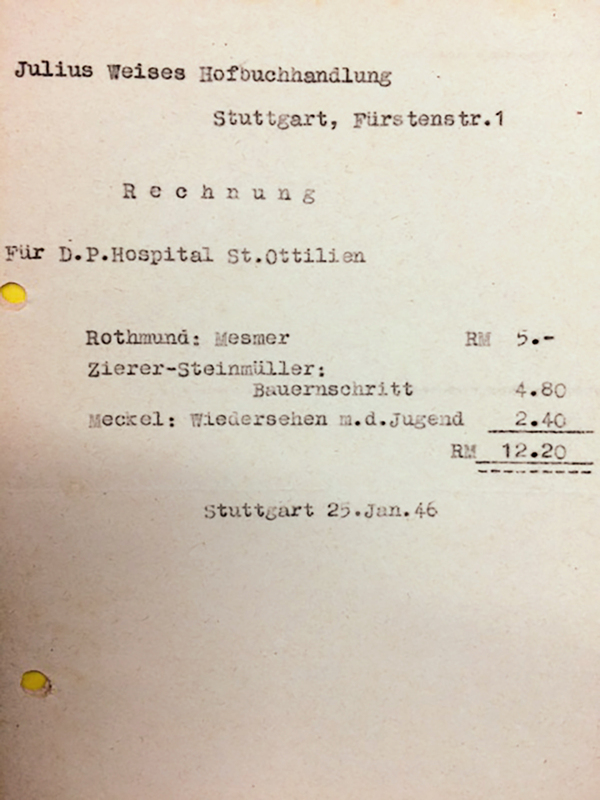 Dr. Zalman Grinberg, as accompanying doctor, organized the transport of the wounded survivors to the nearby German military hospital of St. Ottilien which became the start for the later DP Hospital. 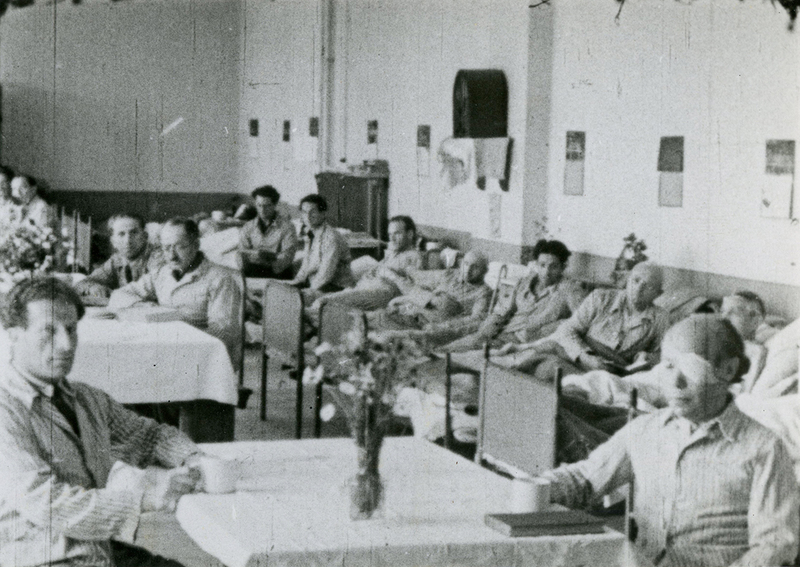 Nurse Erika Grube served in the rehabilitation center of the UNRRA hospital. 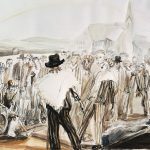 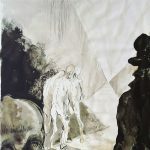 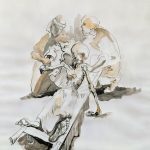 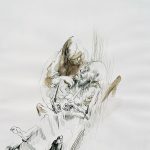 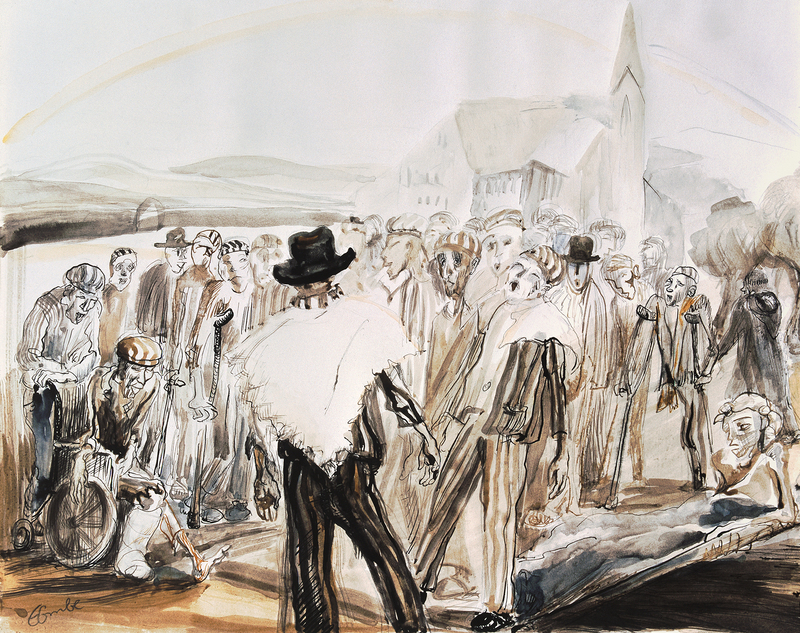 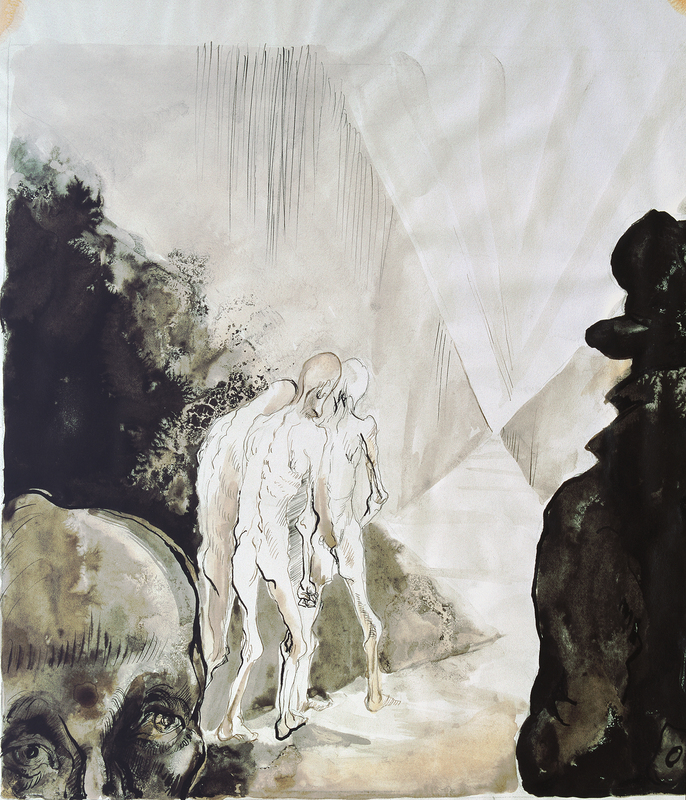 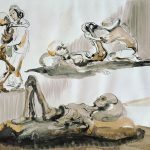 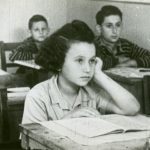 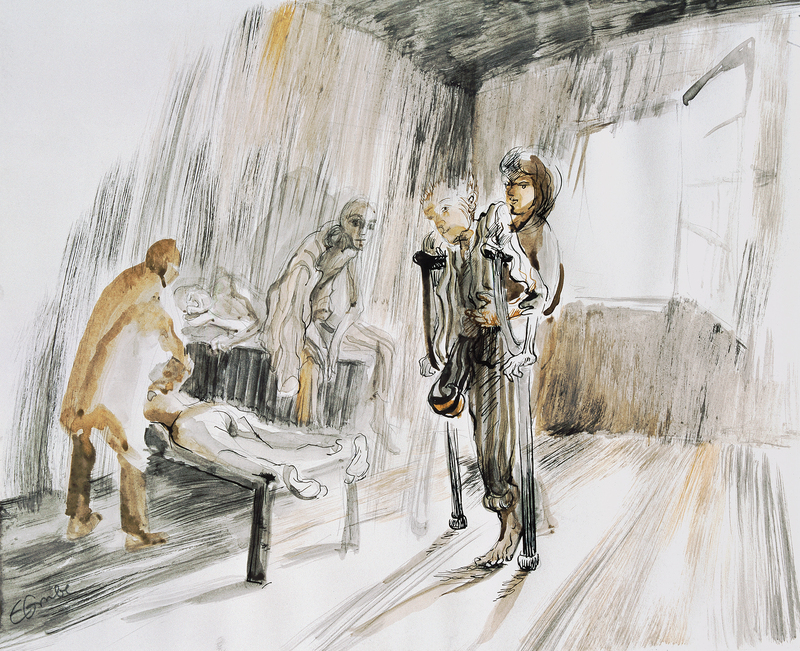 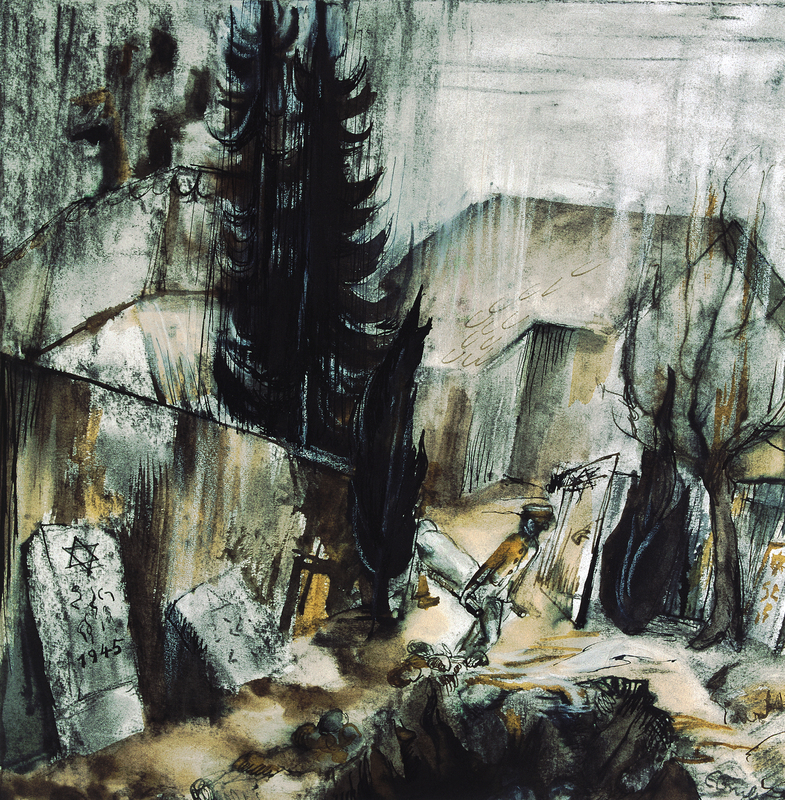 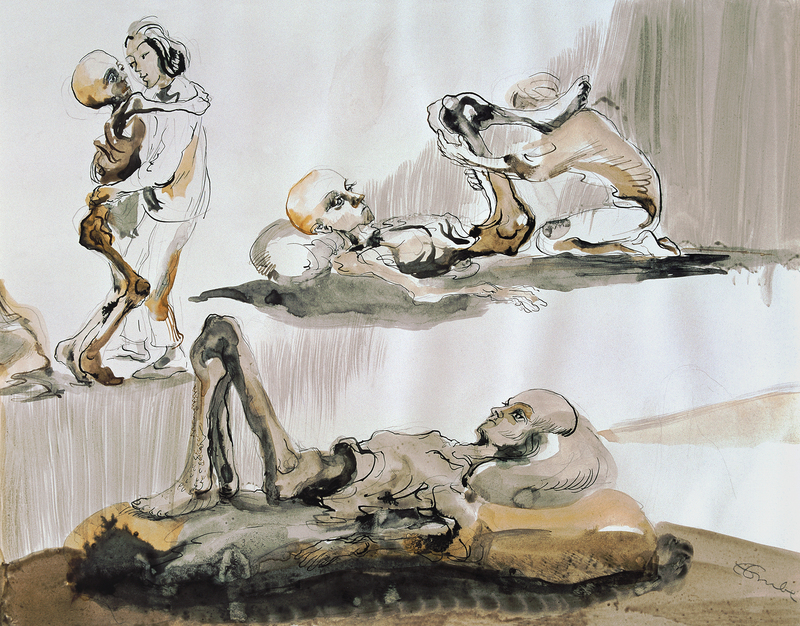 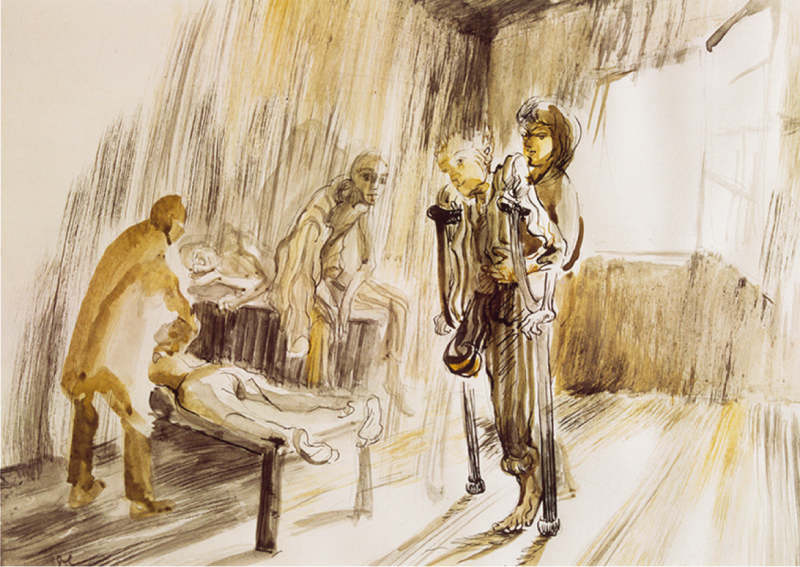 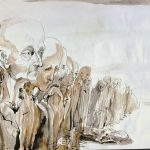 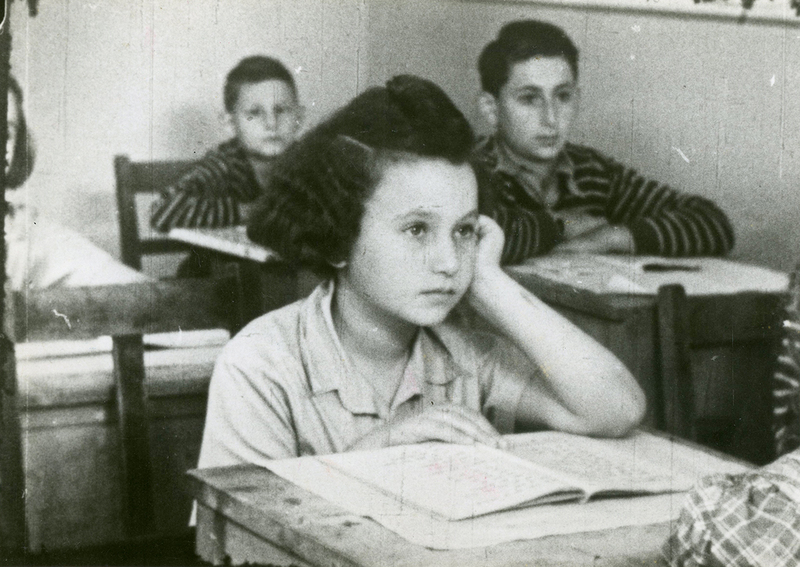 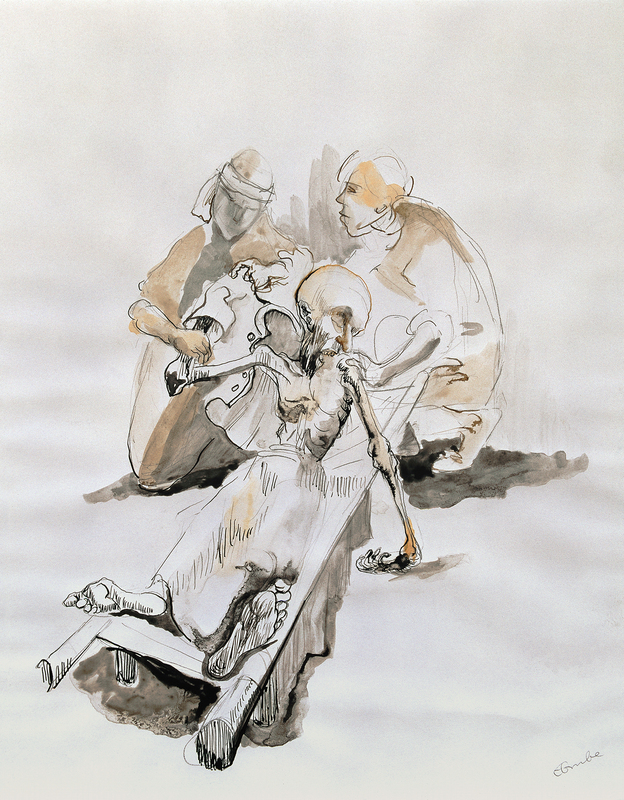 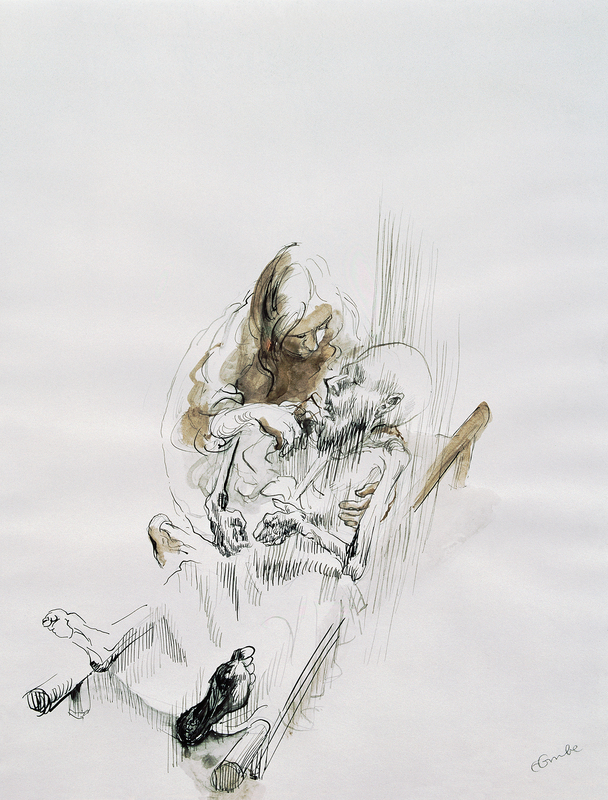 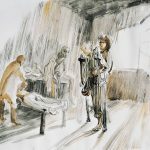 She produced eight drawings of her therapeutic experiences which today are preserved in the Yad Vashem Center. 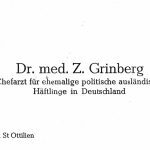 Description in English: Eight drawings and in German: Acht Grafiken. 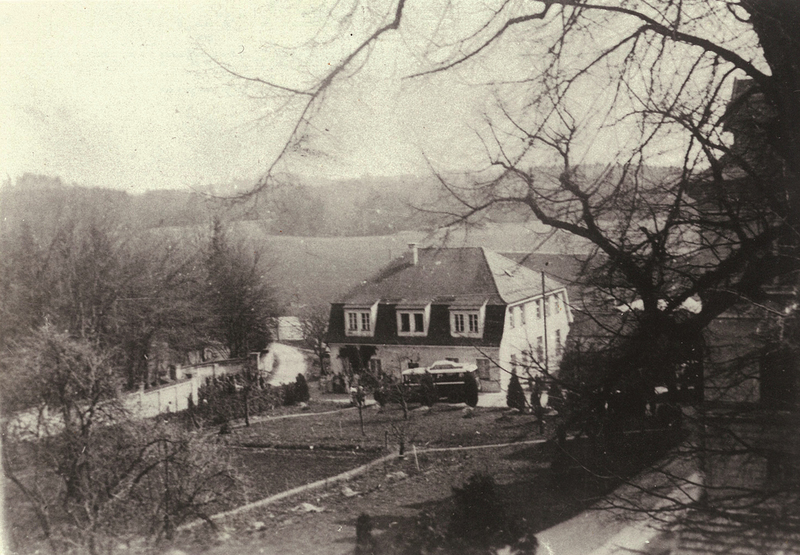 The image shows the view from the former main entrance road (coming from Eresing resp. 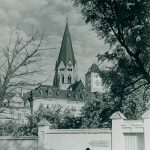 Türkenfeld) to the monastery. 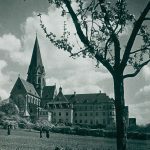 On the monastery roof, the flag of the Red Cross was already installed by the former German military Hospital as protection against Allied air raids. 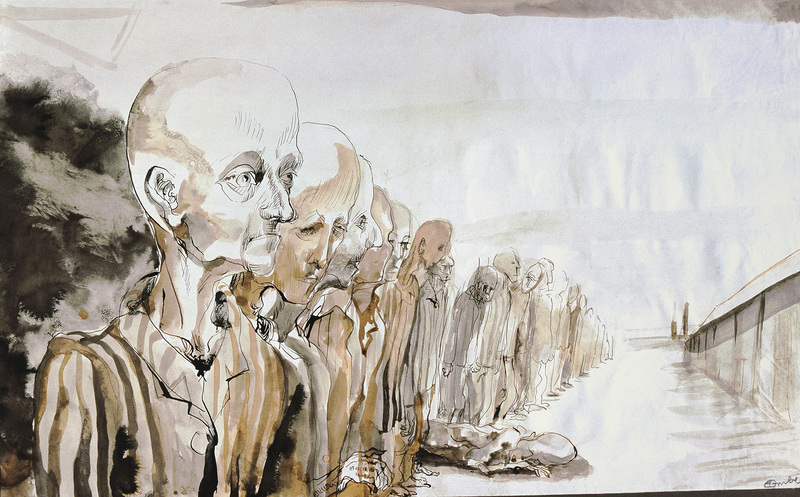 See the reference in US Holocaust Memorial Museum. 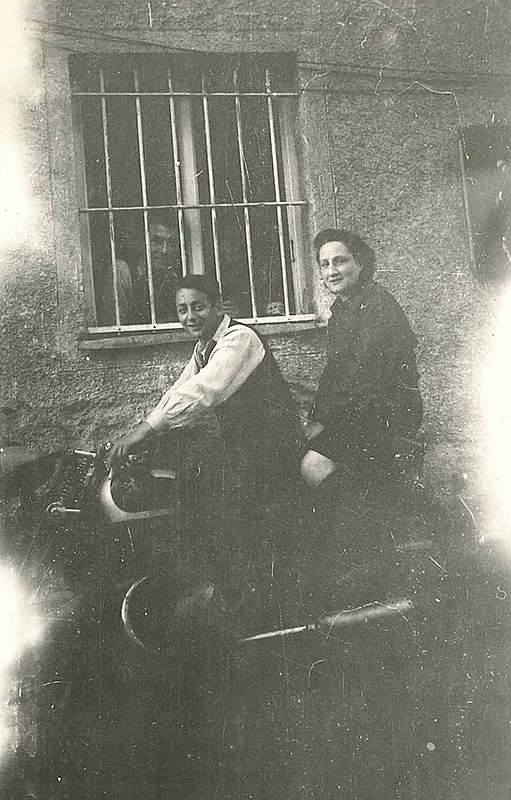 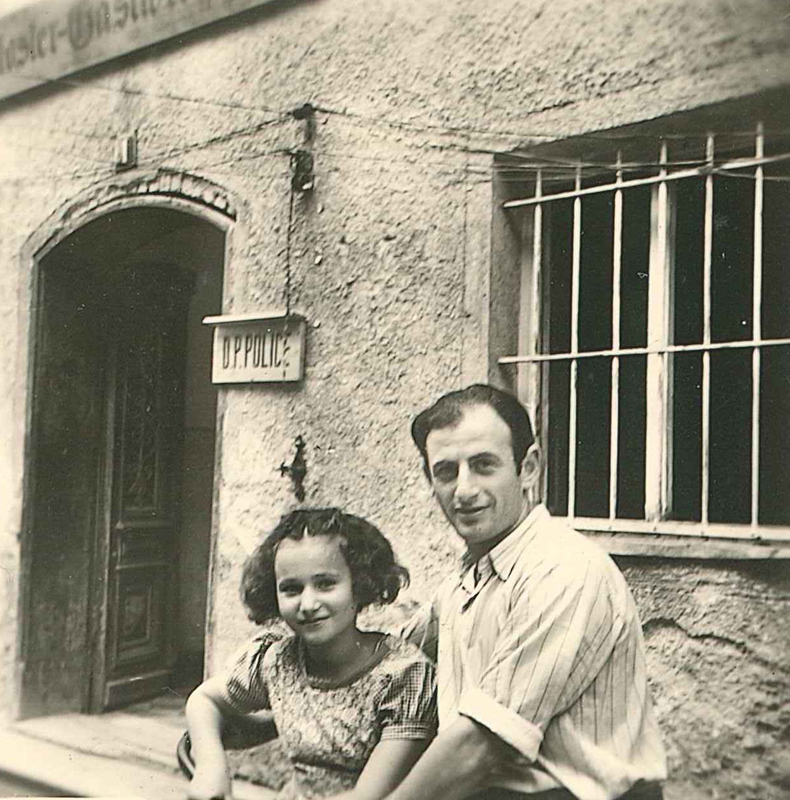 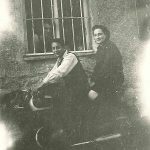 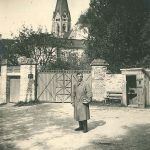 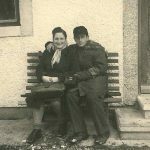 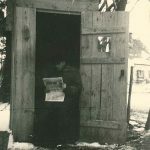 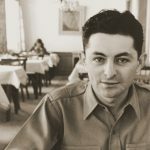 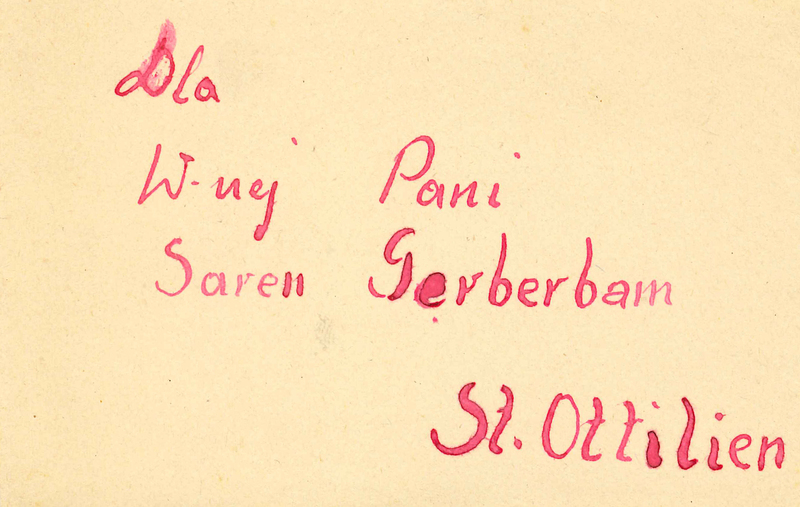 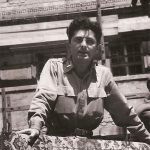 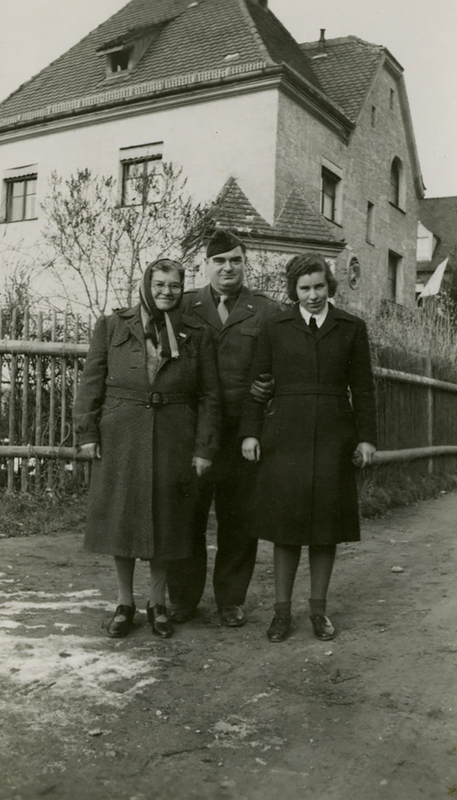 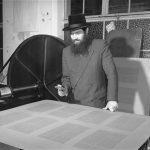 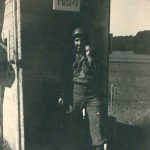 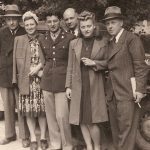 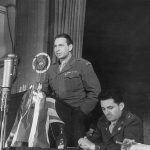 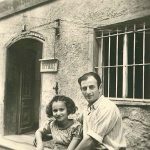 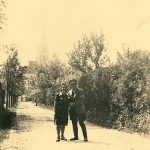 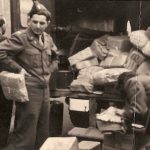 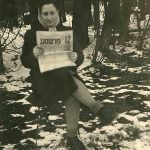 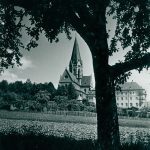 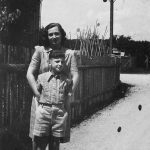 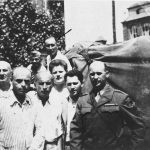 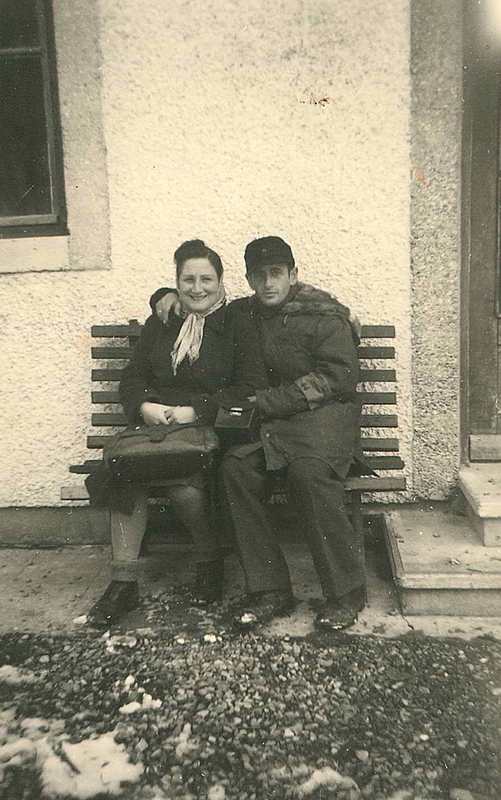 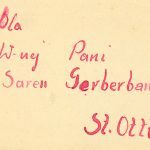 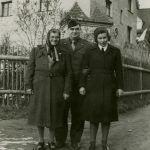 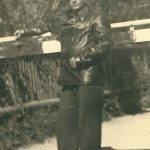 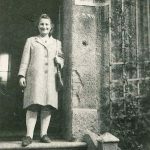 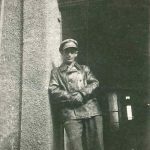 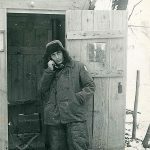 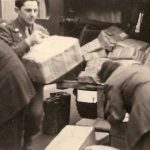 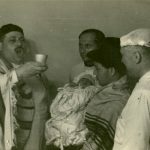 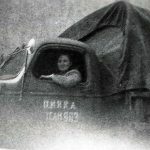 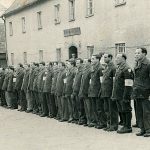 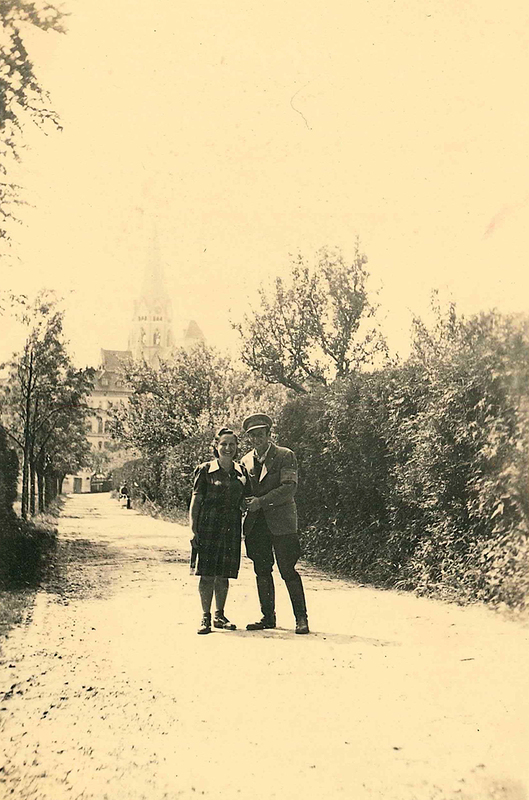 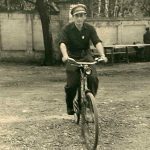 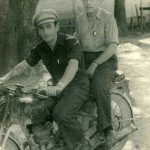 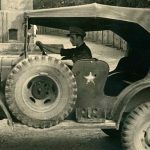 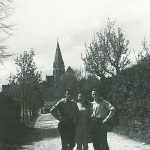 The photographs are drawn from the album of Abram Savicky who served in St. Ottilien as DP-Policeman from 1945 to 1947 and of his wife Sara, nee Gerberbaum. 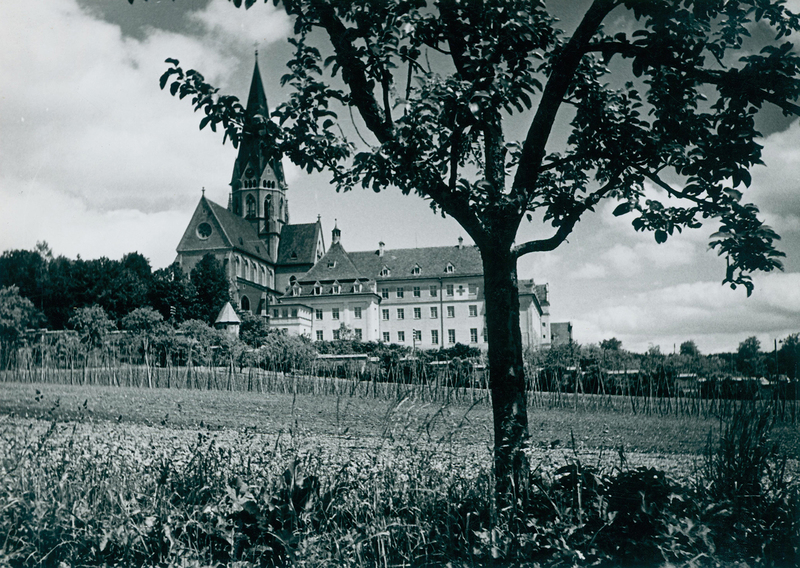 Photographs by courtesy of © Dr. Alec Savicky. 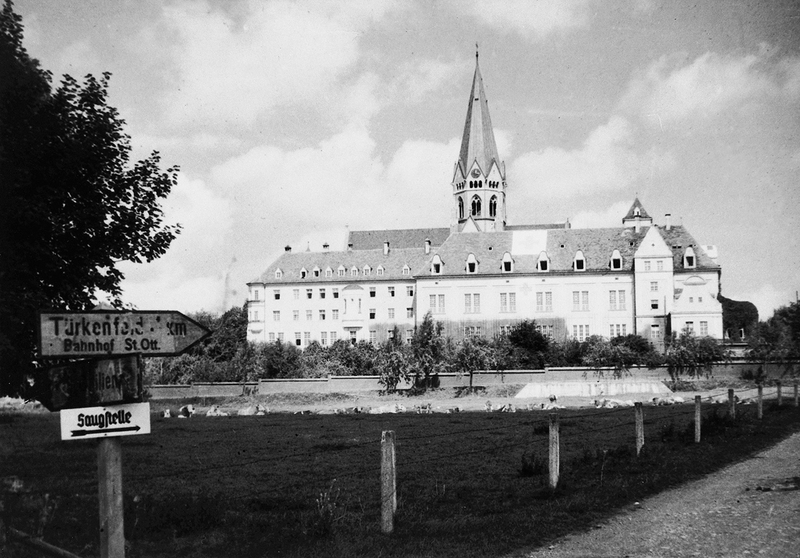 Checkpoint of the DP police at the Northern exit of the monastery (direction Geltendorf). 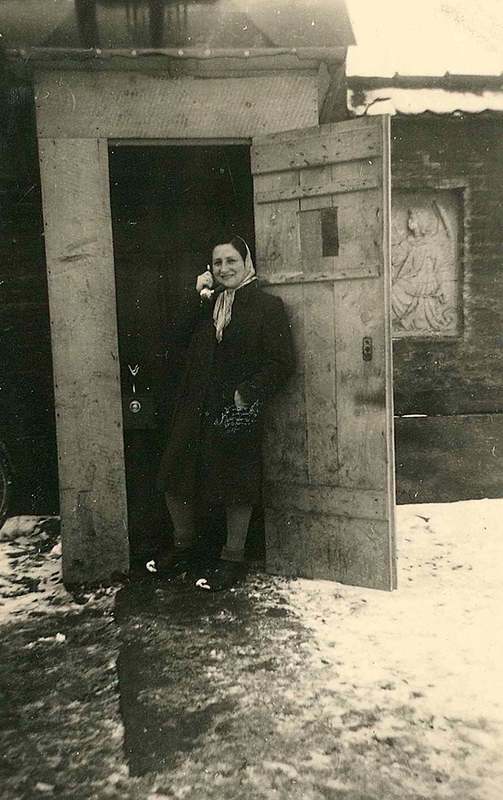 Saren Gerberbaum phoning. 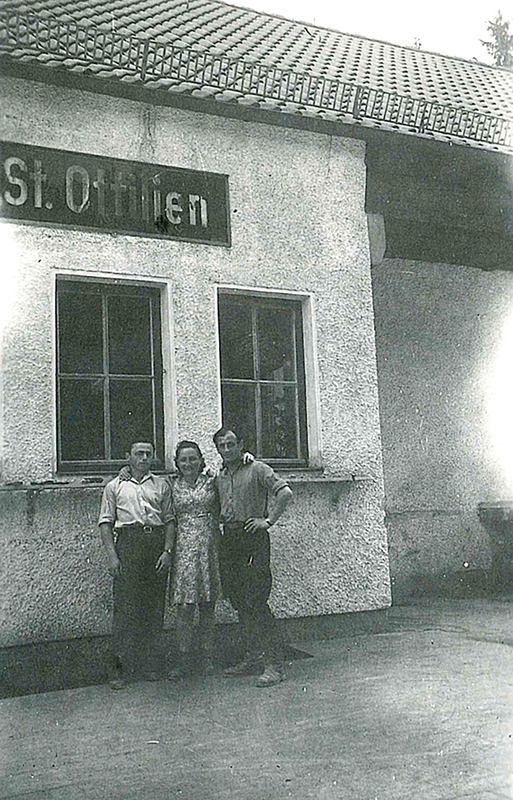 At the checkpoint at the North-Eastern exit of St. Ottilien, looking in Northern direction. 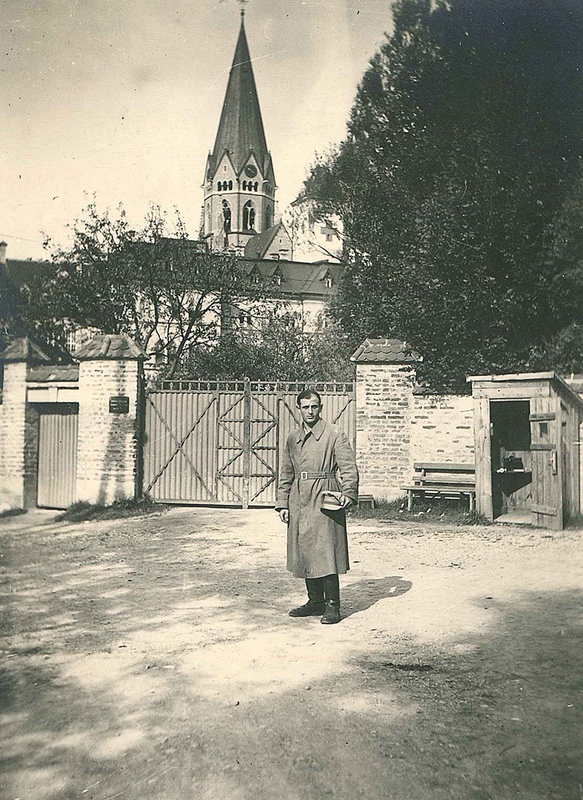 Checkpoint at the North-Eastern exit of the monastery compound. 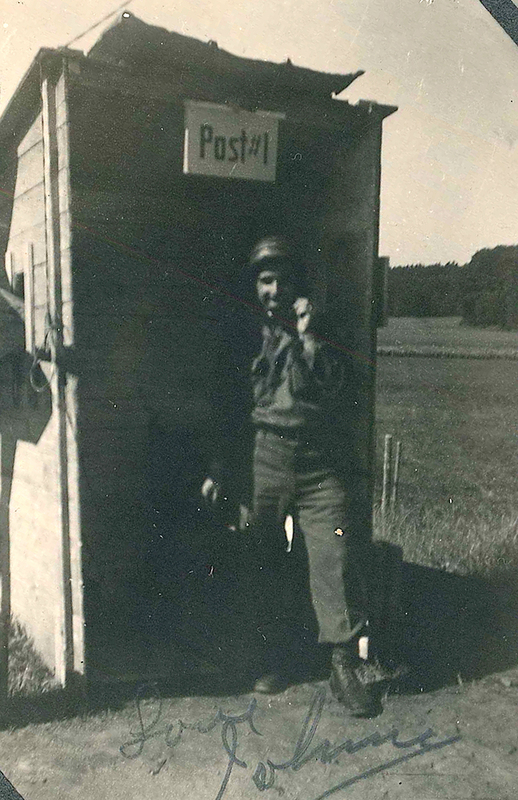 In the background the delivery station and to the right the laundry. 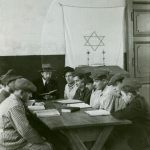 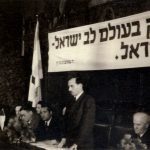 Abram Savicky at the left. 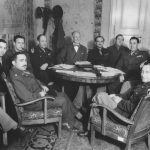 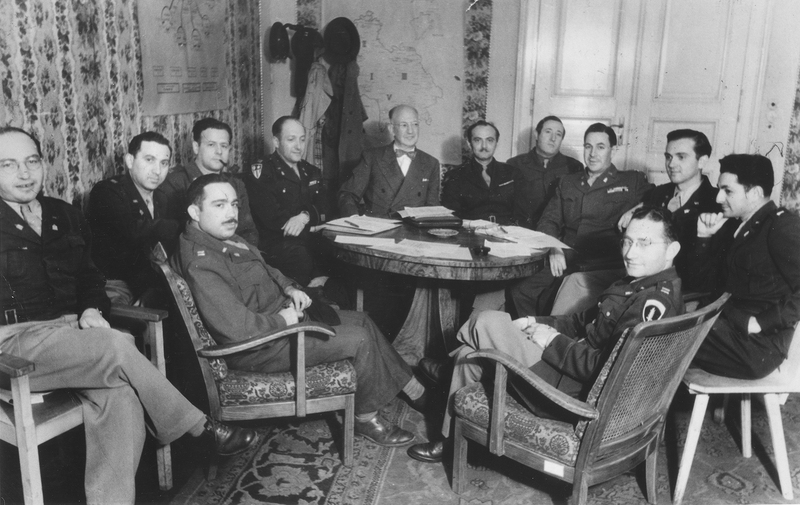 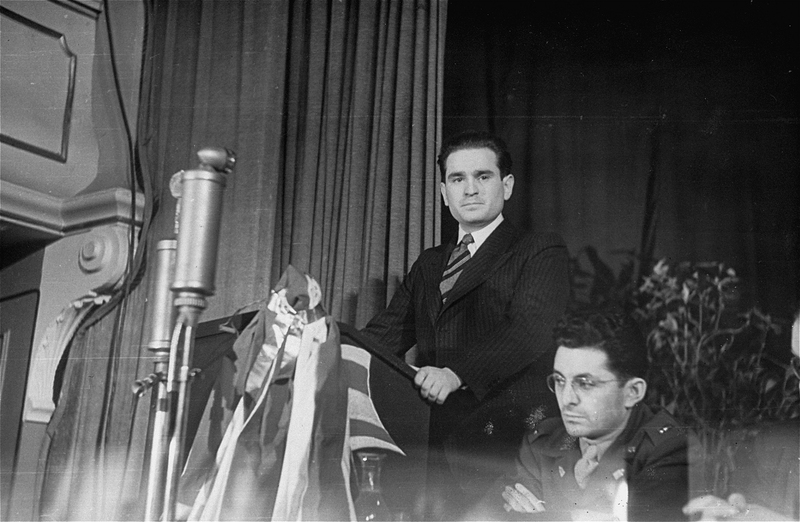 Photo 1: David Ben-Gurion (second from the right) seated at the speakers‘ table. 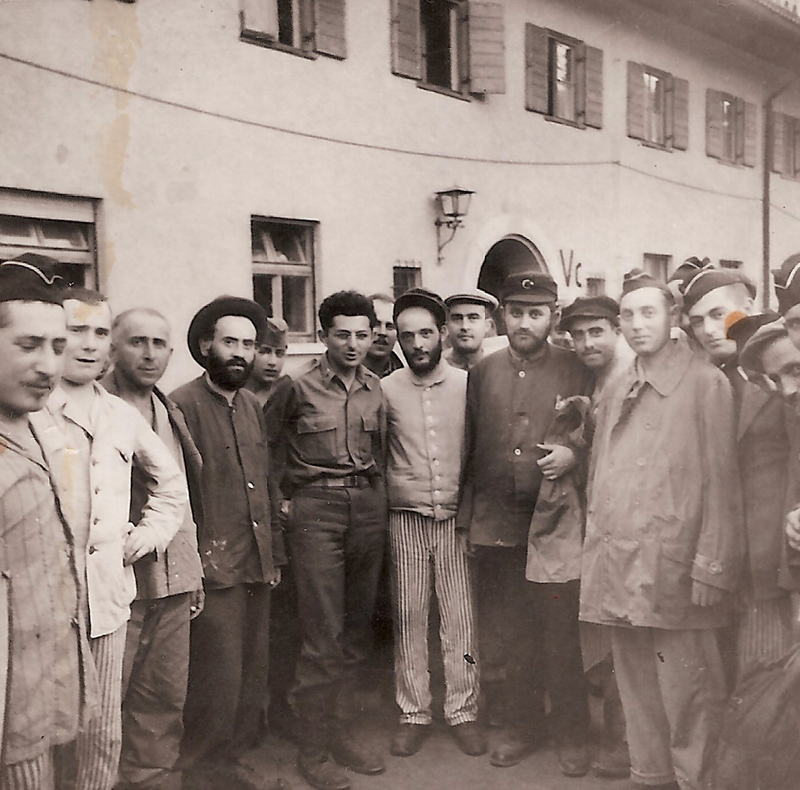 Dr. Zalman Grinberg is speaking as chairman of the Executive Council of Holocaust Survivors. 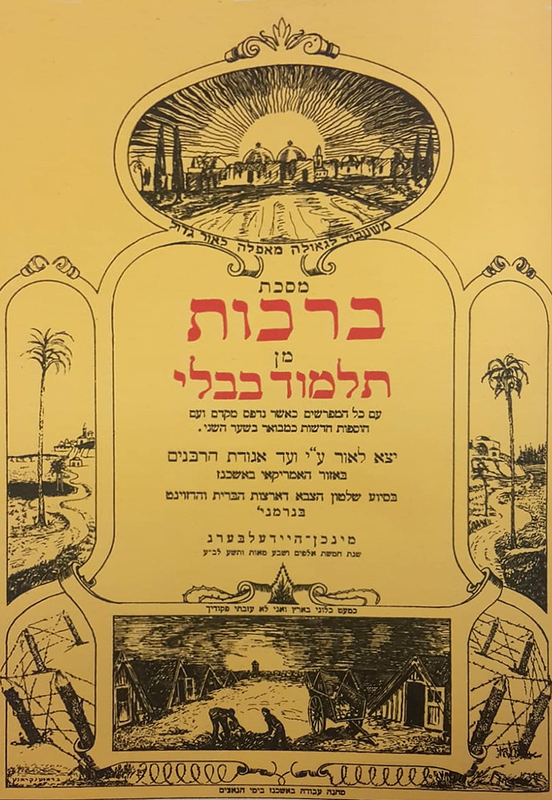 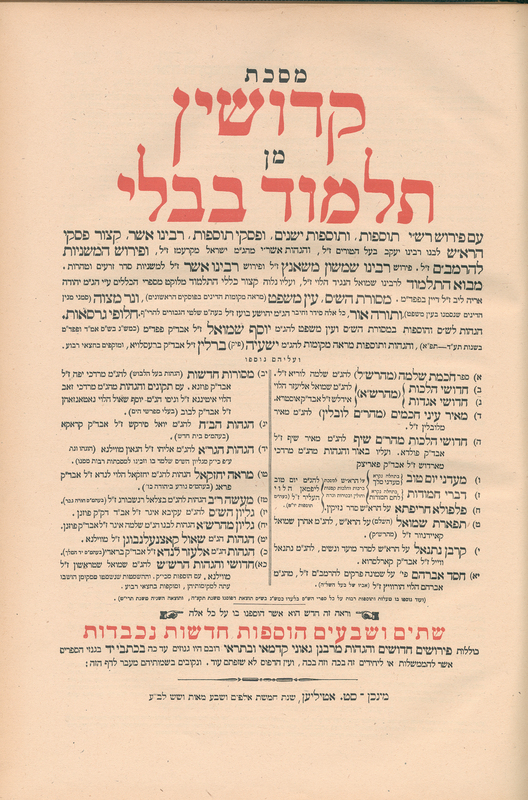 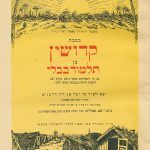 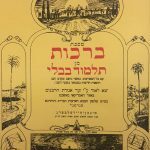 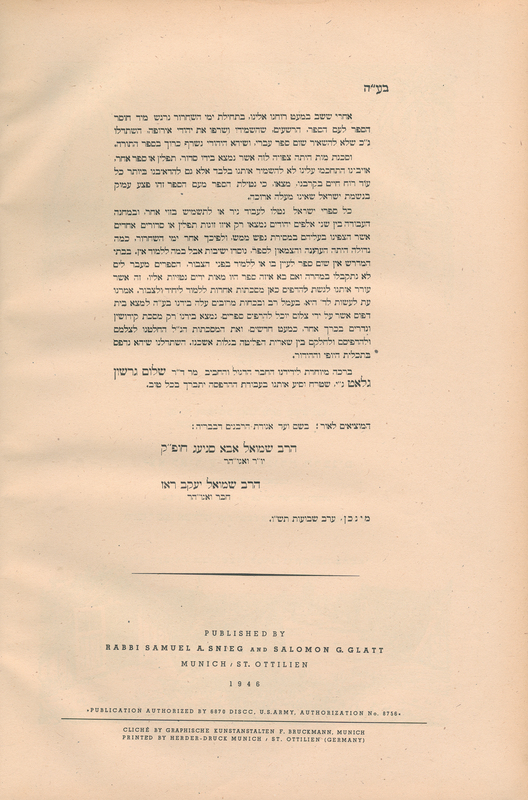 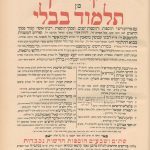 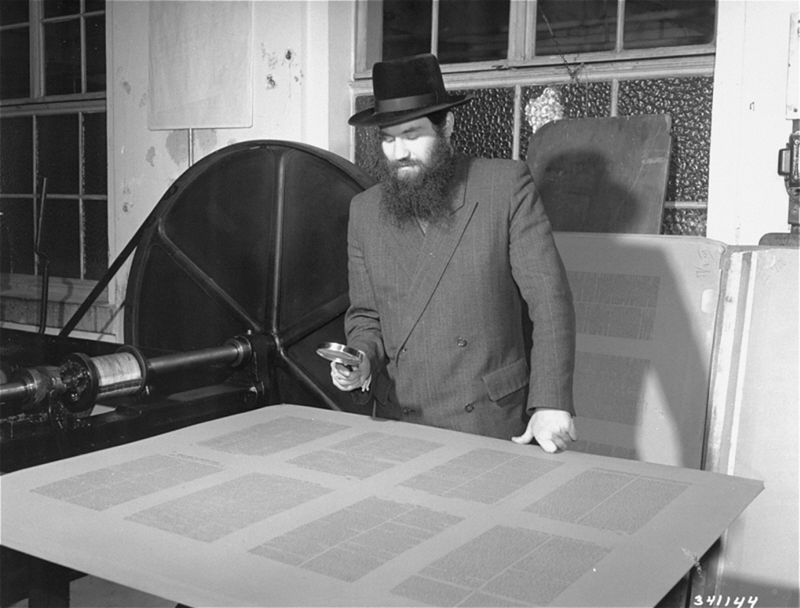 The Hebrew banner shows a line from a poem by David Shimonovitz: „As long as a Jewish heart beats somewhere in the world, there will be a land of Israel“. 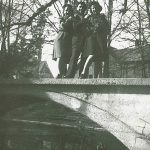 Copyright by Ghetto Fighters House Museum, Catalogue No. 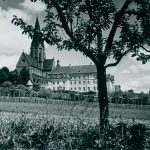 56293. 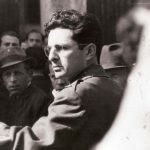 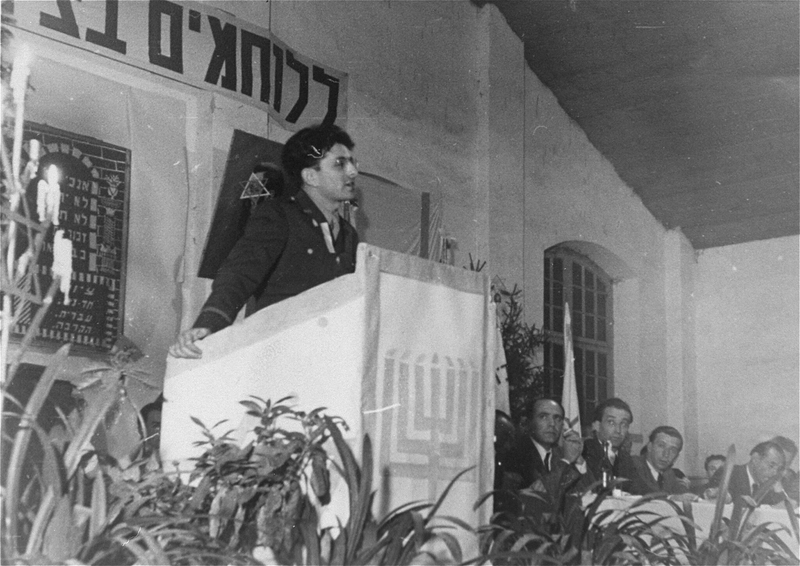 Photo 2: David Ben-Gurion standing at the speakers‘ table. 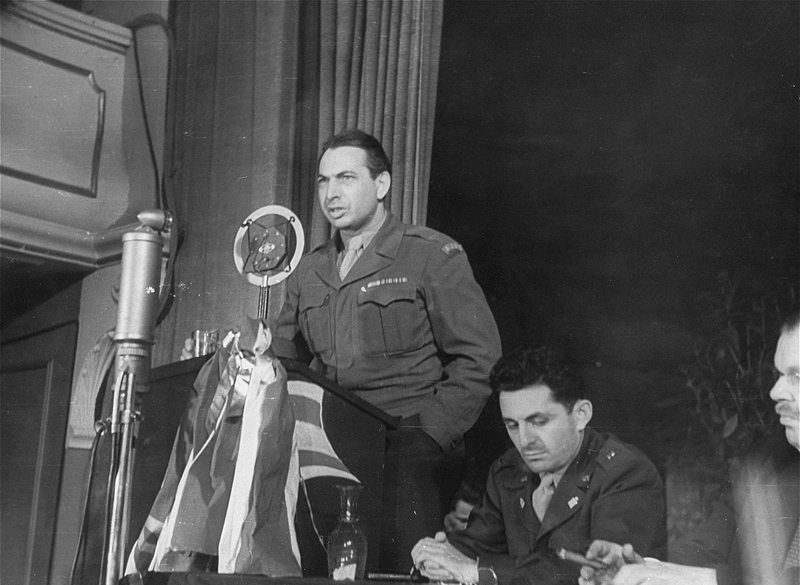 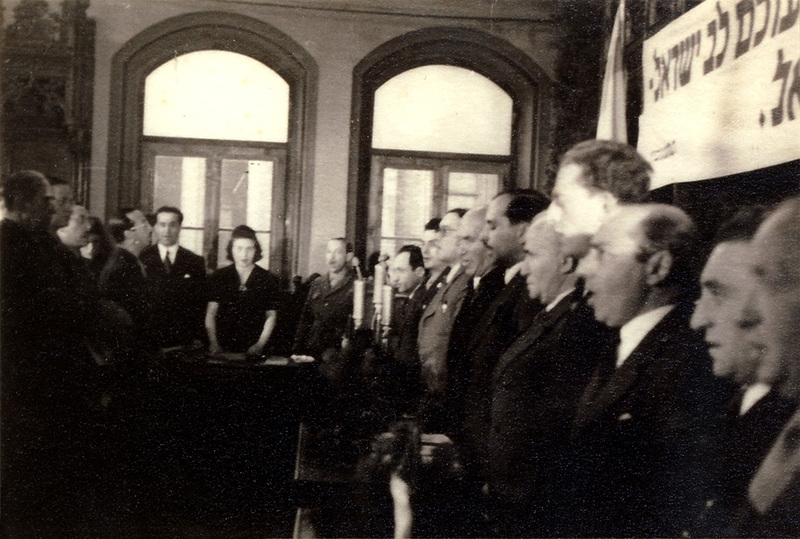 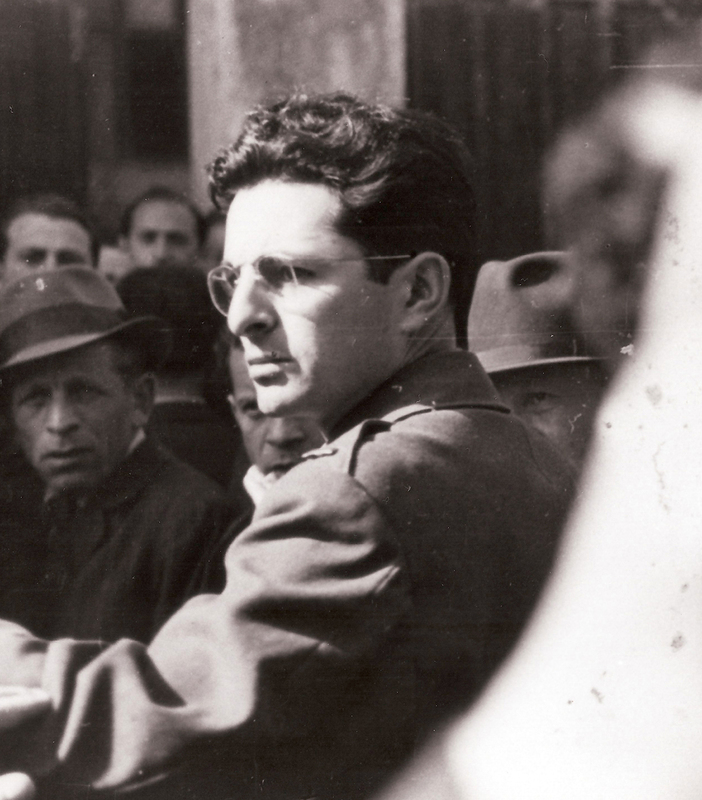 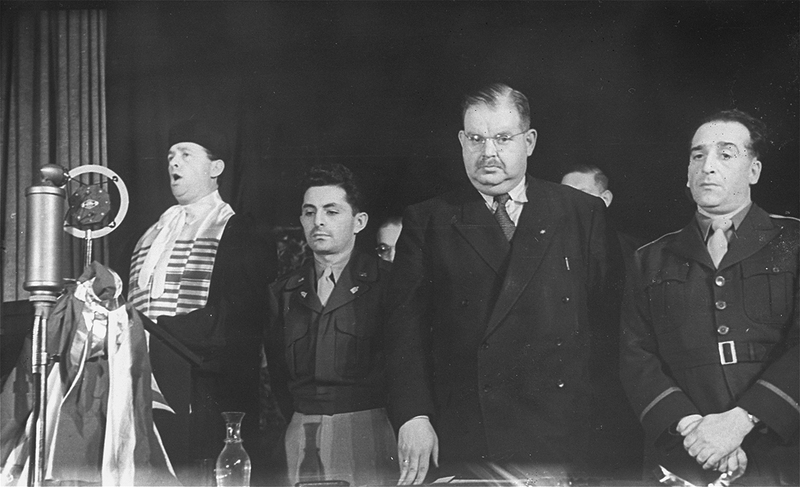 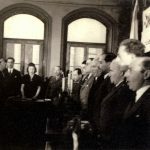 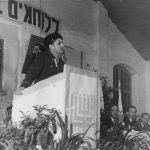 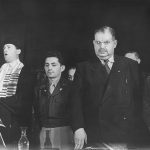 The participants sing the Zionist anthem „Hatikva.“ Dr. Zalman Grinberg stands to the left of Ben-Gurion. 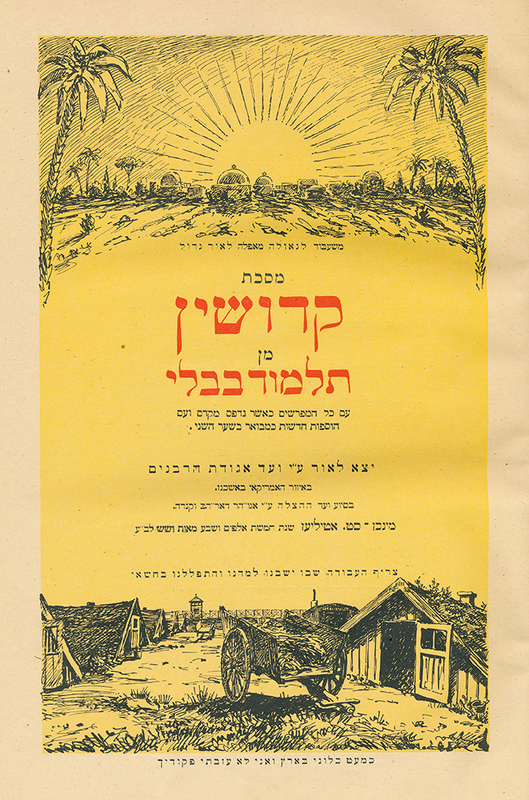 Copyright by Ghetto Fighters House Museum, Catalogue No. 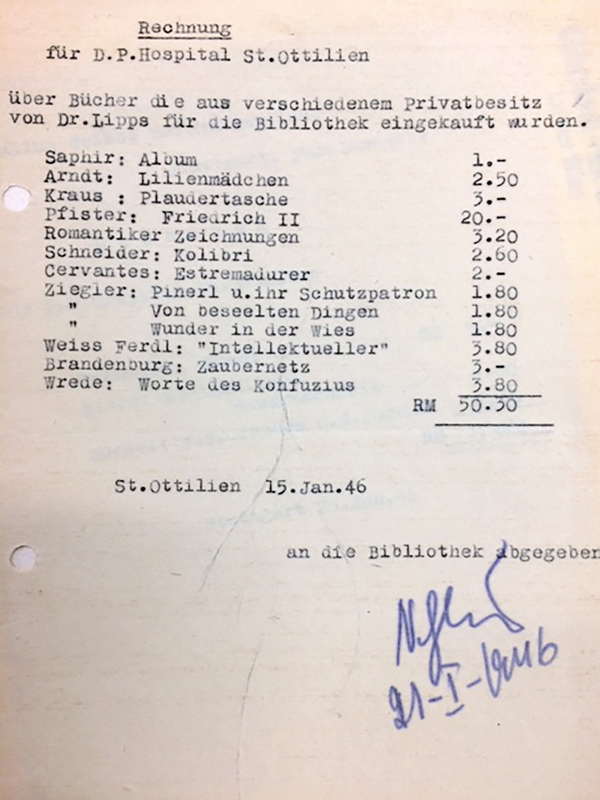 56292. 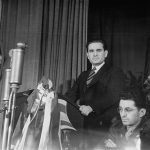 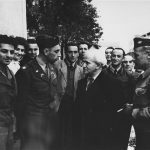 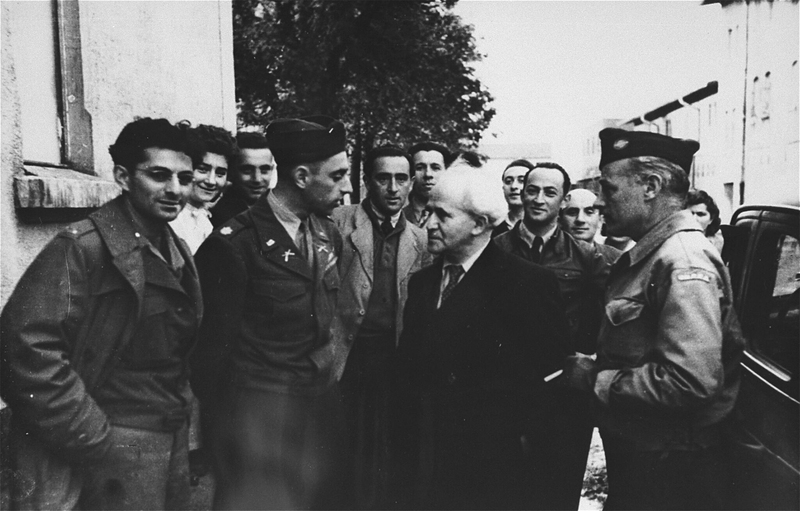 Visit of David Ben-Gurion in Munich on January 25-27, 1946. 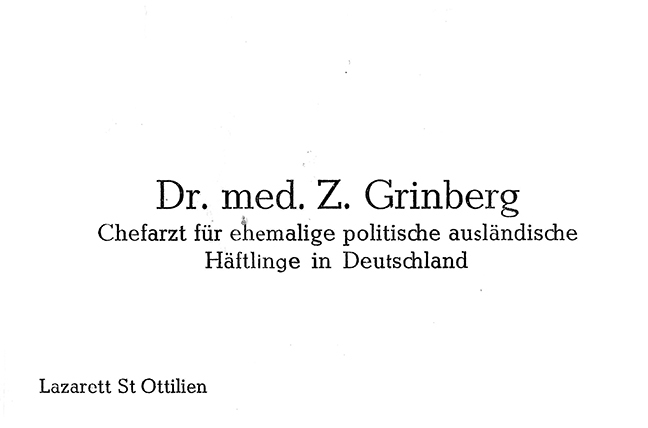 Dr. Grinberg is speaking. 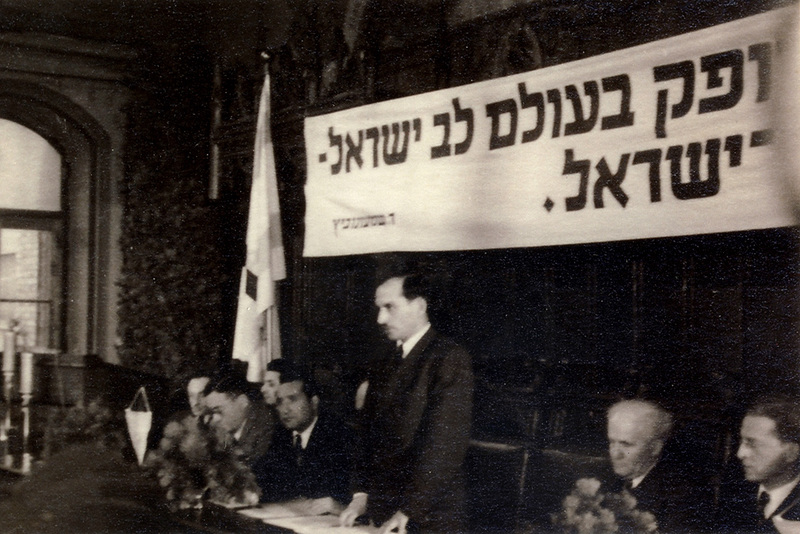 The banner in the foreground reads, in Hebrew: „[the] Future of our people.“ The kibbutz was named „Atid“ [Hebrew: future]. 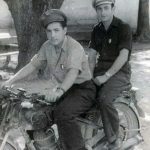 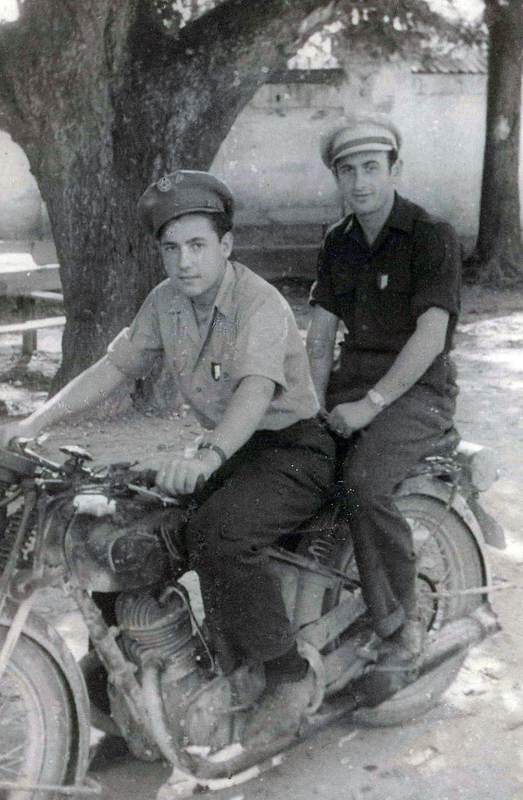 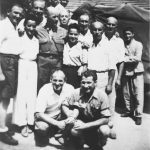 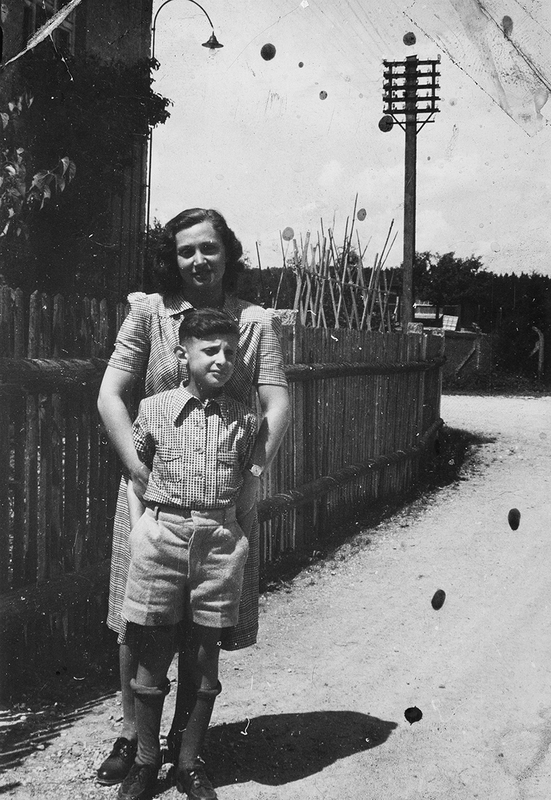 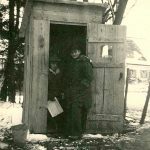 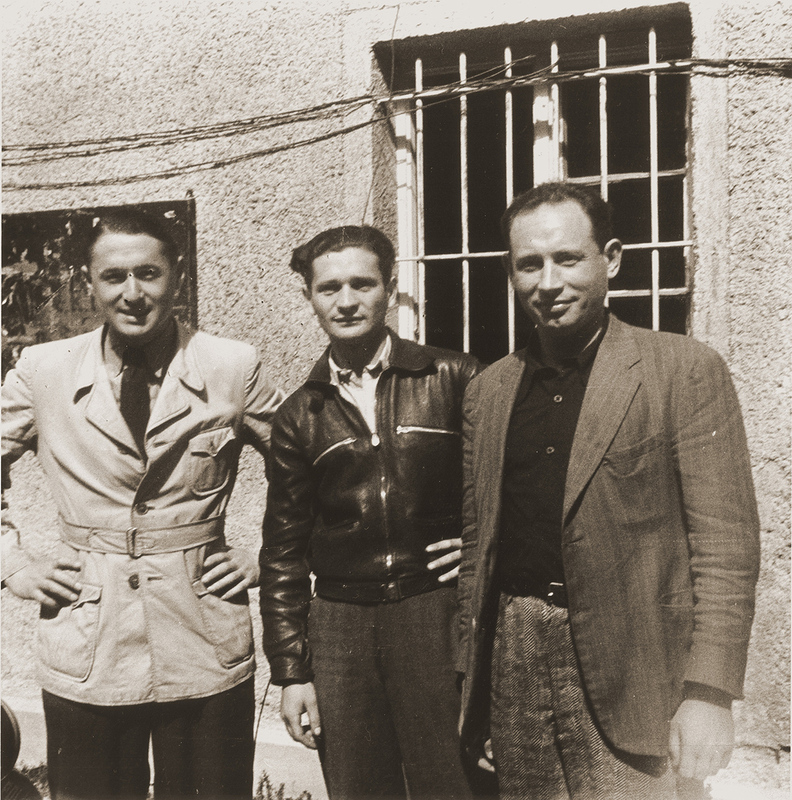 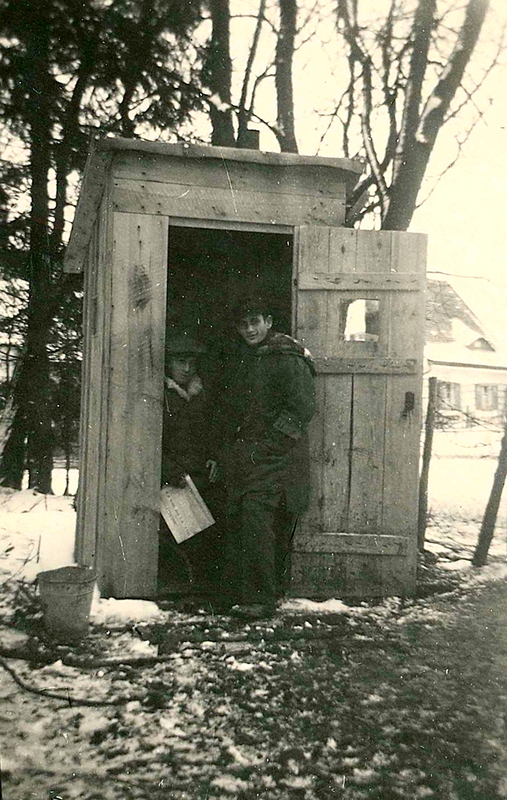 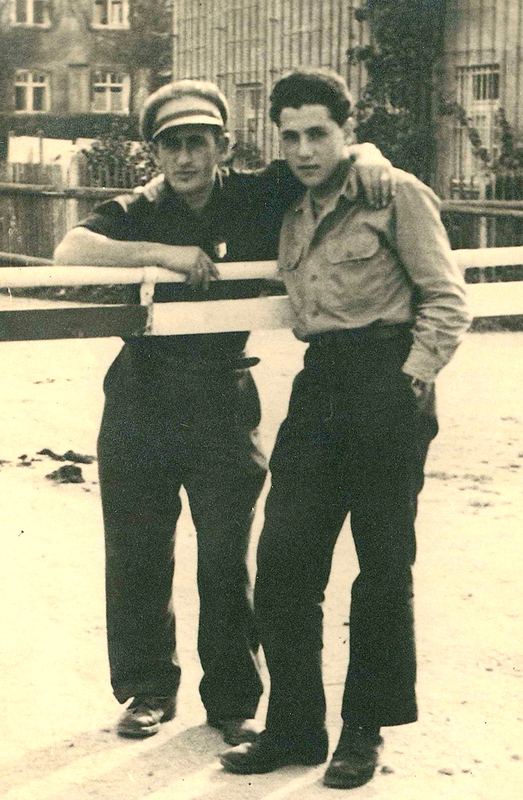 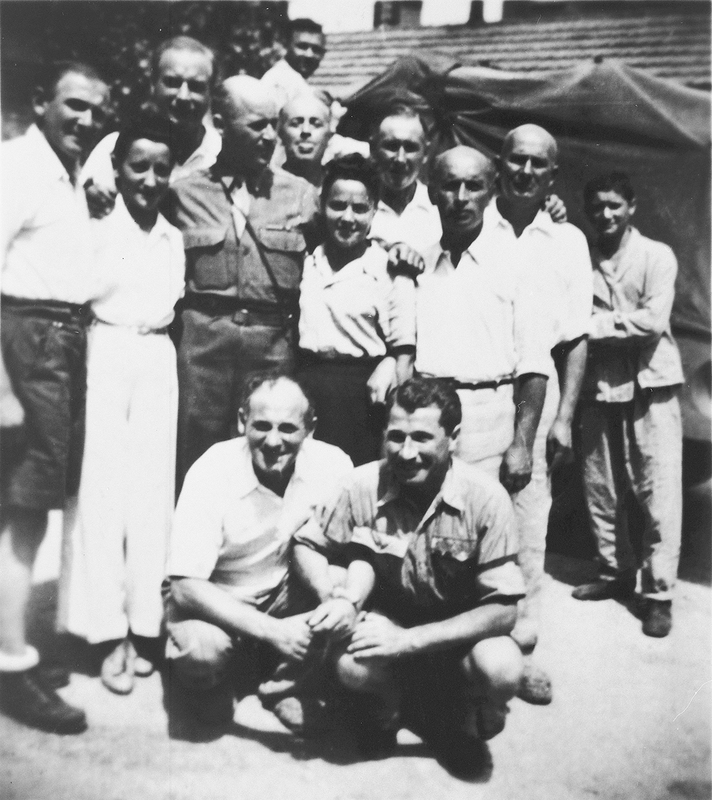 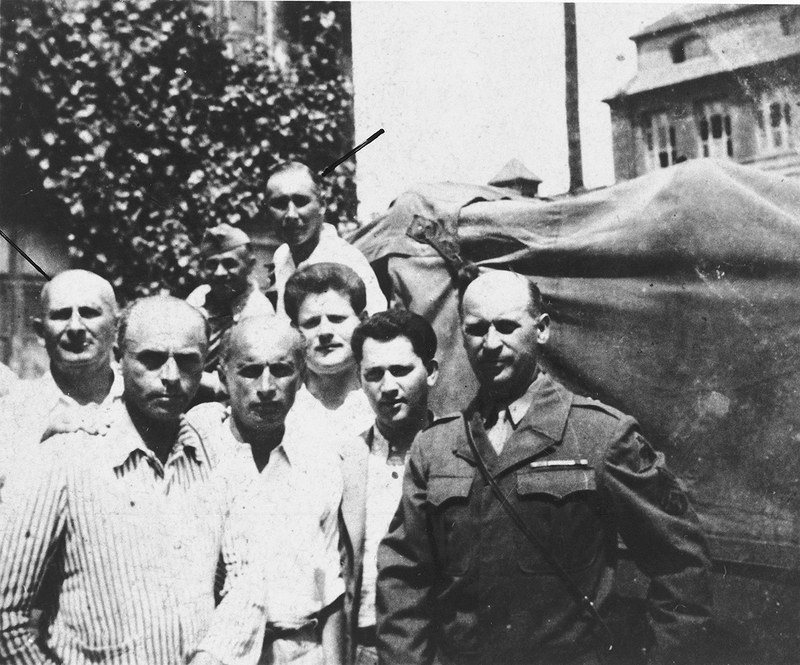 Counselor Motek Goldhecht is standing on the left. 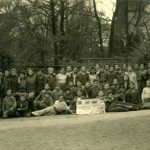 Copyright by Ghetto Fighters House Museum, Catalogue No. 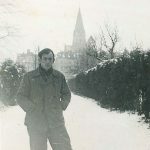 37796. 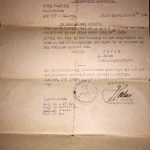 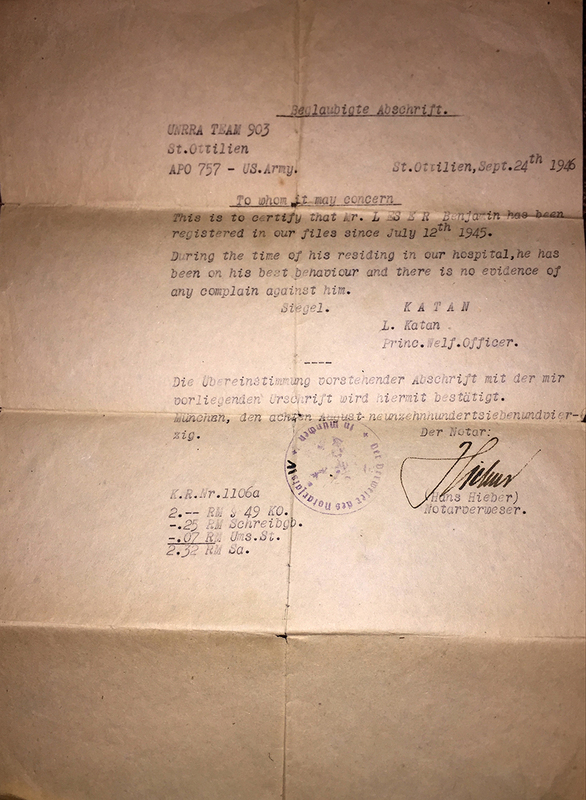 Certificate from Principal Welfare Officer Katan for Ben Lesser that he has stayed in the hospital from July 12th through to September 24th, 1946. 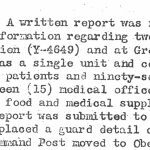 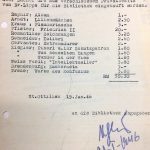 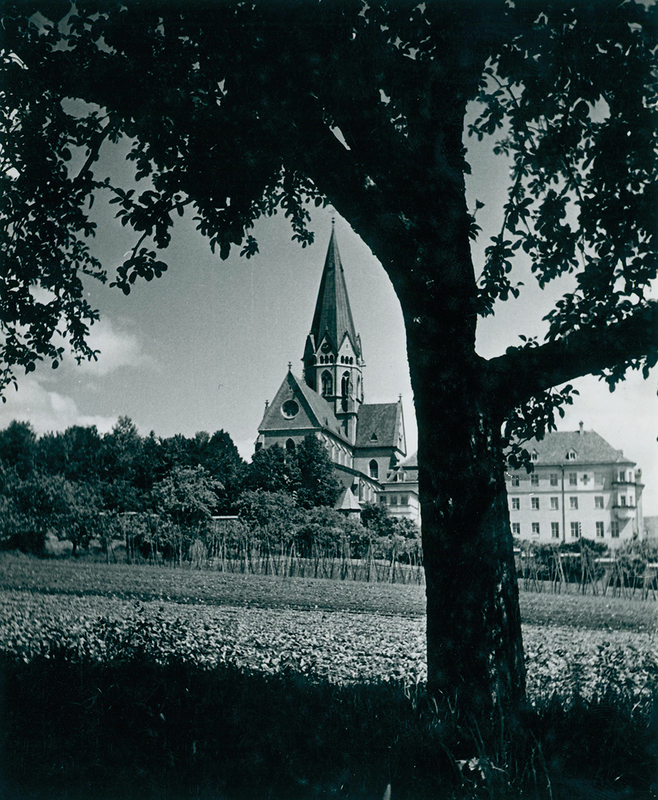 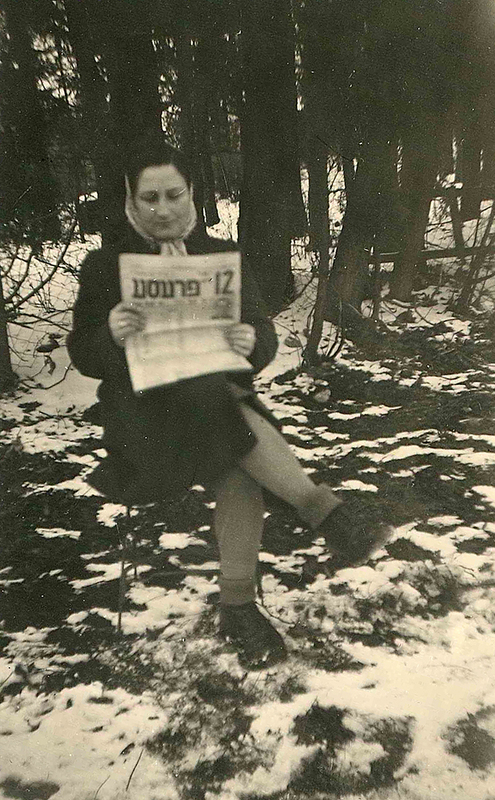 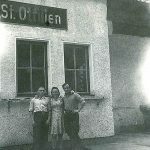 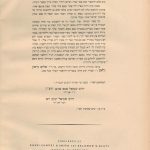 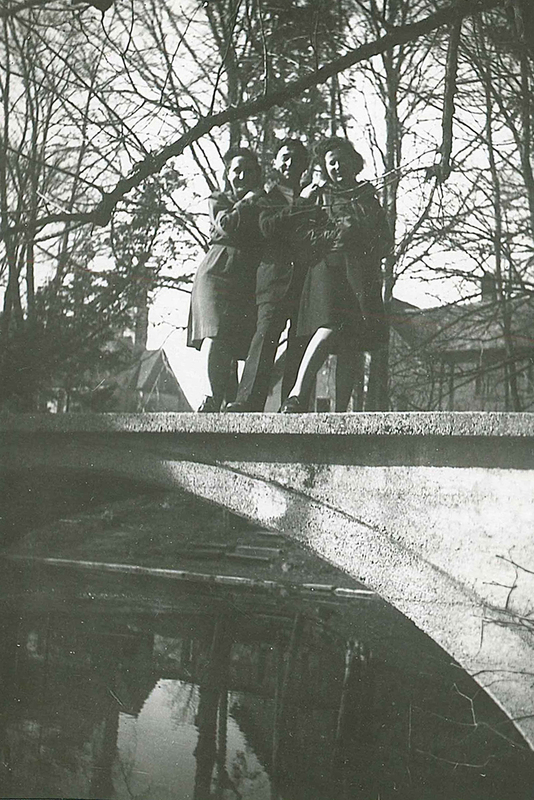 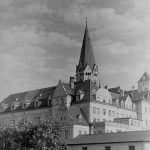 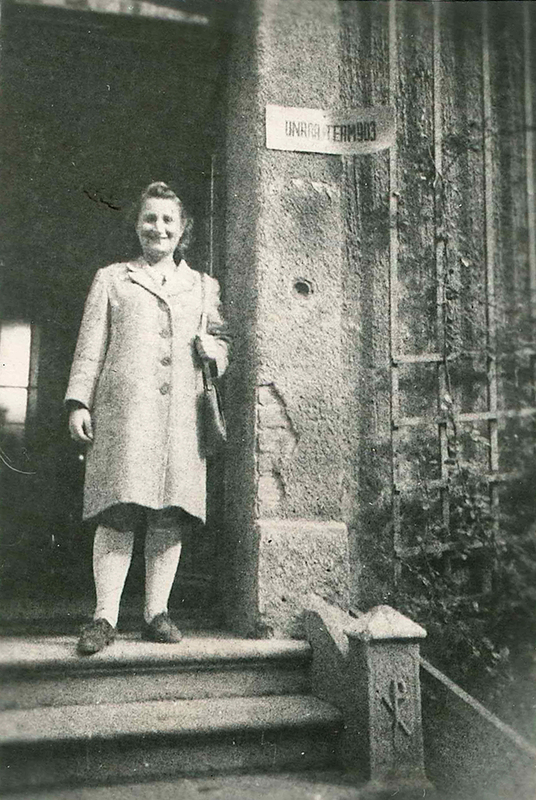 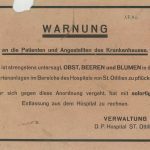 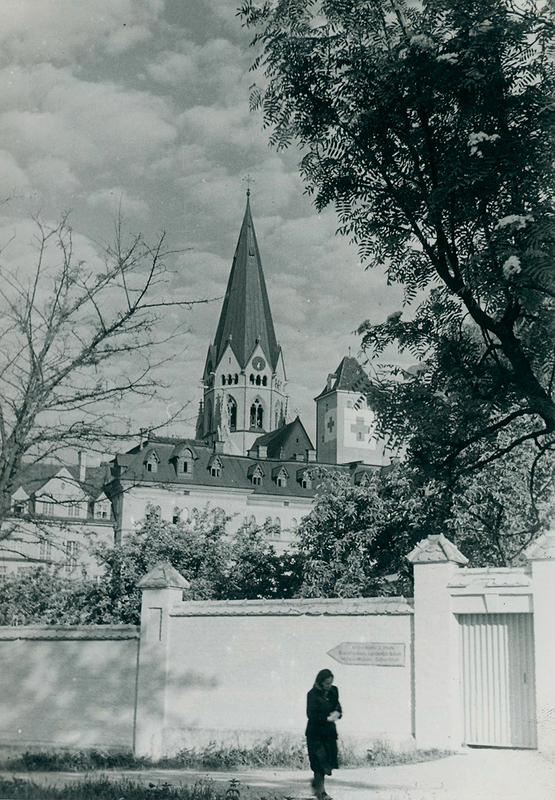 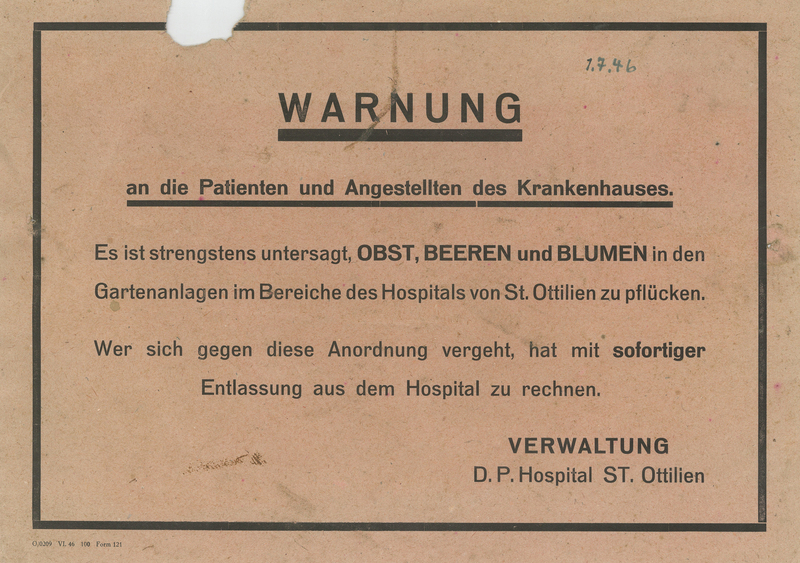 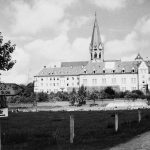 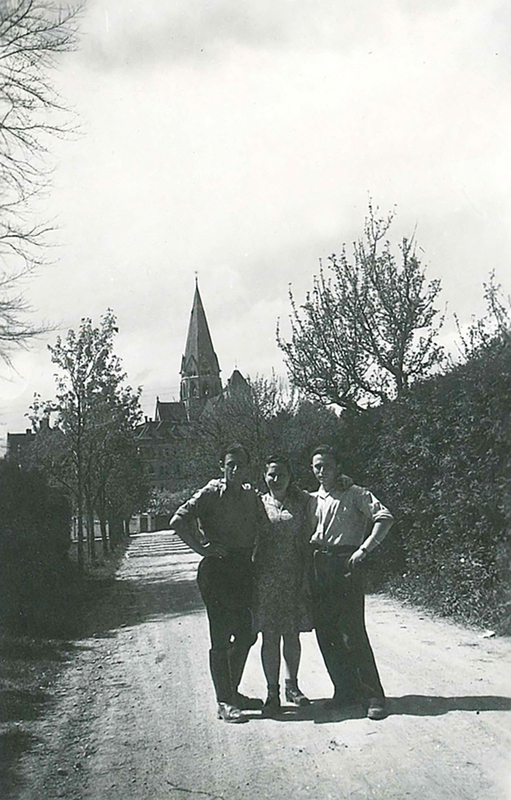 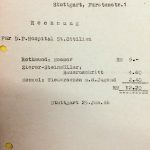 In May 1948, the Jewish Hospital St. Ottilien was dissolved. 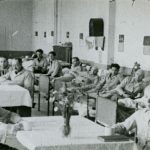 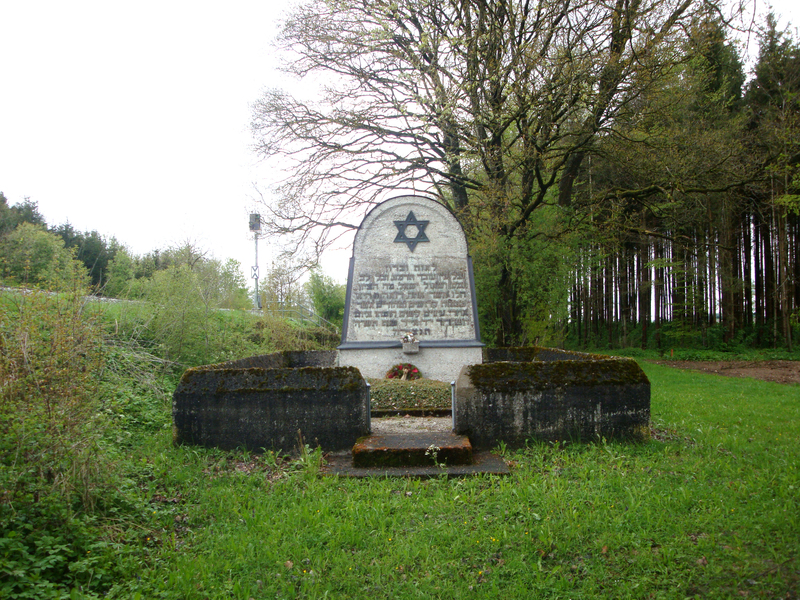 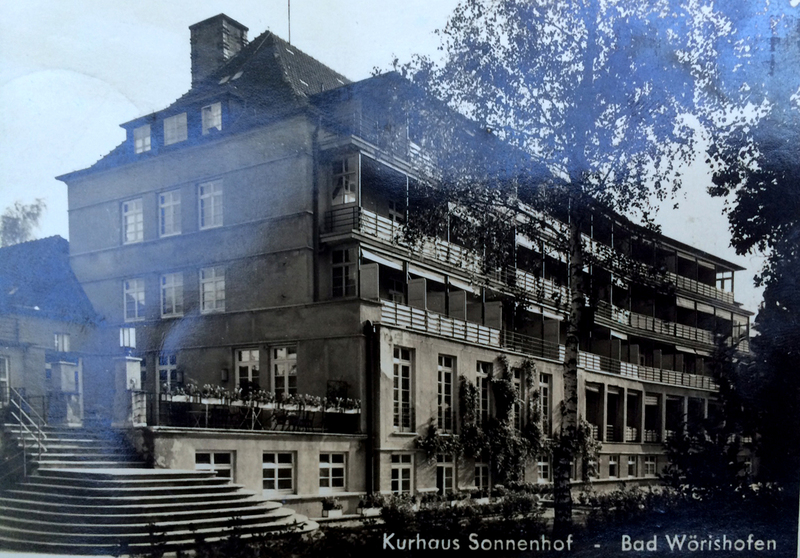 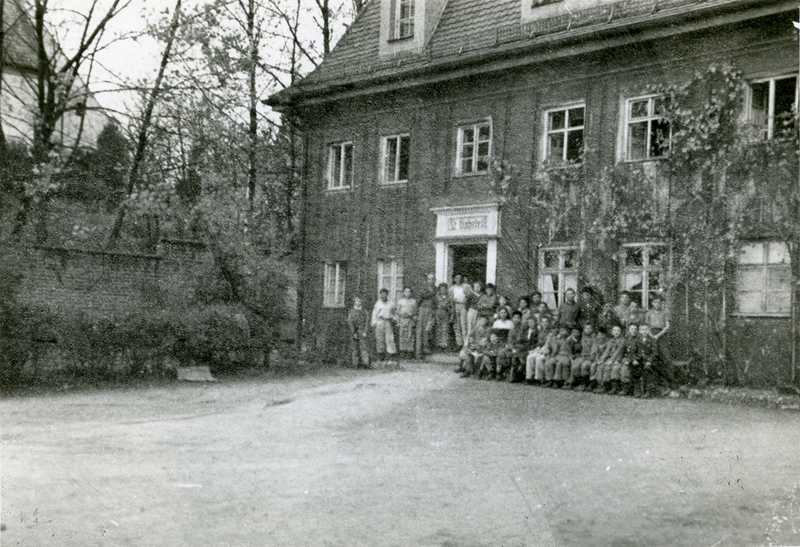 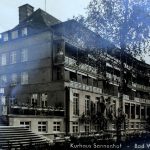 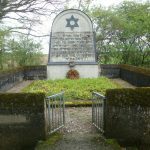 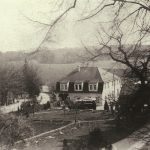 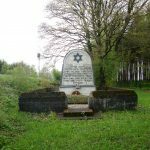 Most of the patients and the medical staff moved to another hospital, the Jewish Hospital and Sanatorium „Sonnenhof“ in Bad Woerishofen, 40 kms West of St. Ottilien. 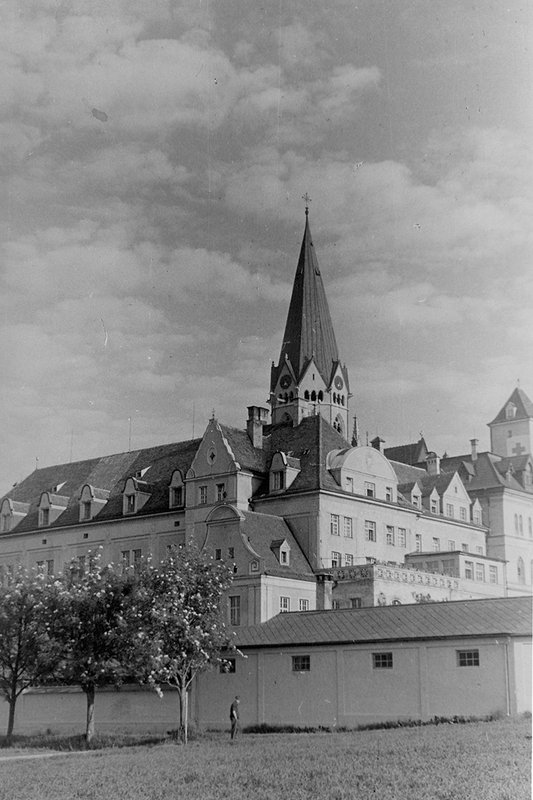 The Hospital „Sonnenhof“ was dissolved in 1951 and is now a wellness Hotel.